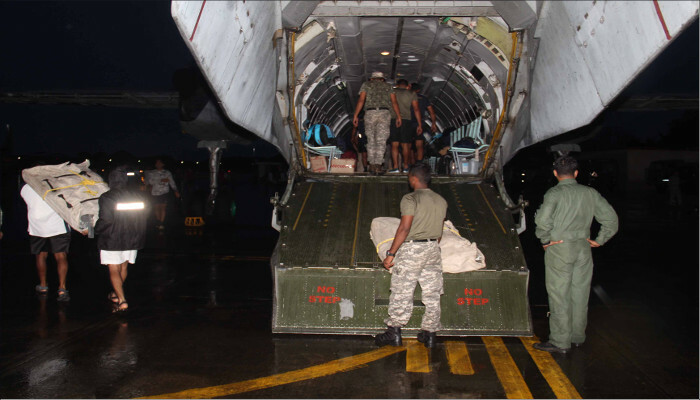 The Southern Naval Command continued with heightened deployment of teams and assets for Operation Madad for the tenth day – 19 August 2018. 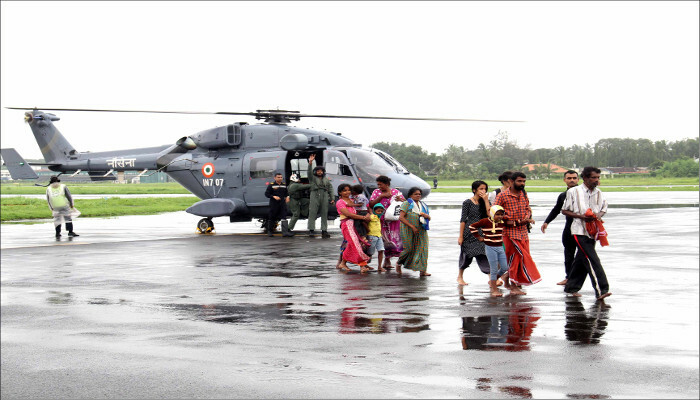 SNC rescue teams have been augmented by Gemini boats, divers and other resources from both Eastern and Western Naval Commands of the Indian Navy. 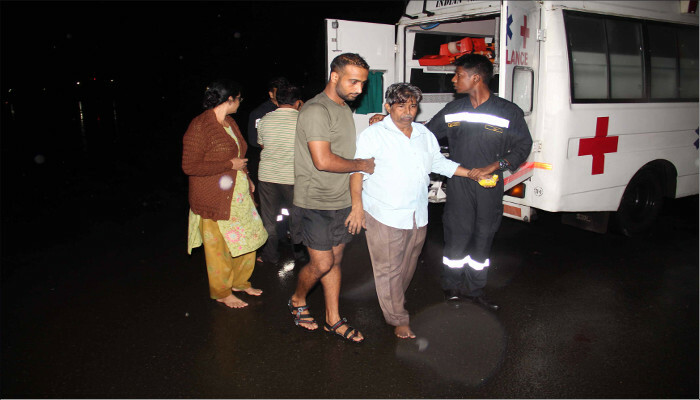 92 diving teams have been deployed at various locations across the affected districts. 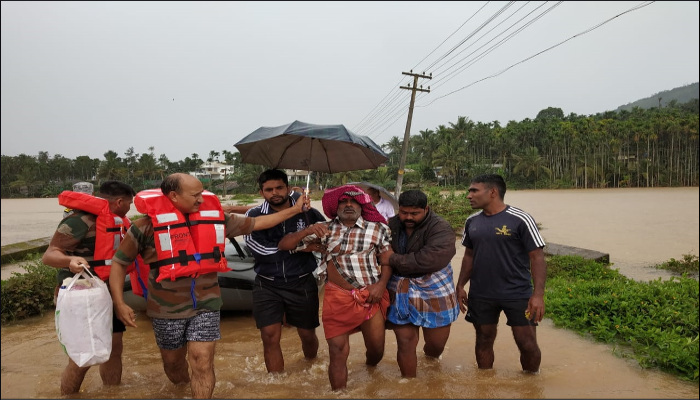 Rescue operations were extended to two more districts of Kannur and Alappuzha, in addition to the three districts already being covered of Thrissur, Ernakulam and Pathanamthitta. 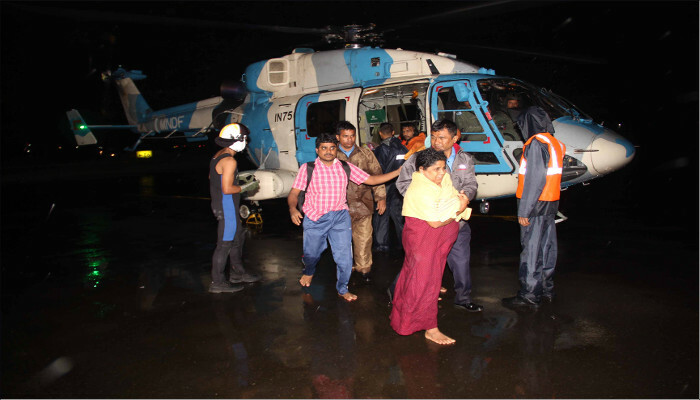 A total of 14,797 people have been rescued by boats, over 600 people by air and eight tonnes of relief material has been air dropped upto 19 August 2018. 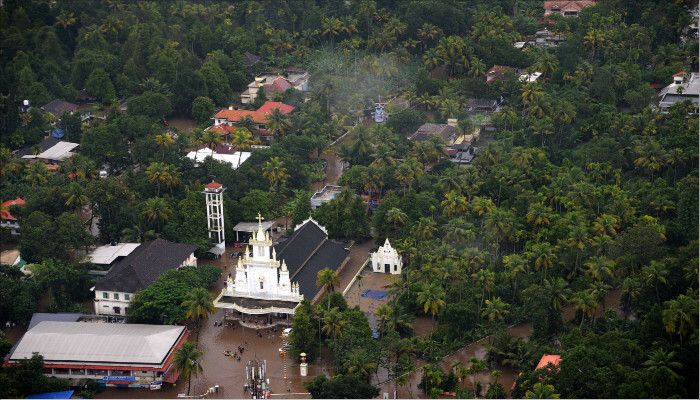 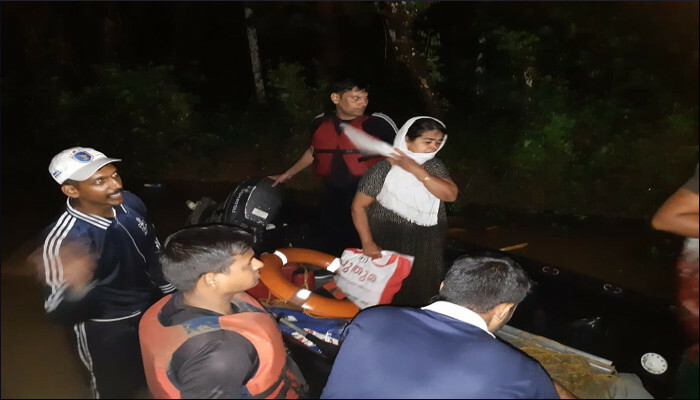 About 250 persons located at Moolamvelli Church were shifted in civil boats to a safe place by the rescue team at Pizhala Island. 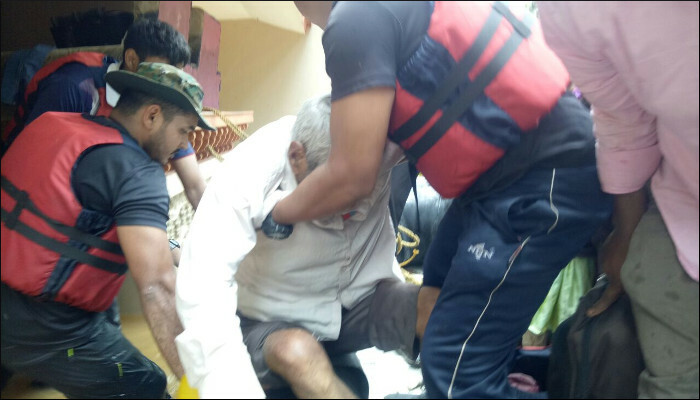 Altogether, rescue teams were able to rescue more than 3,575 people by boats on 19 August 2018. 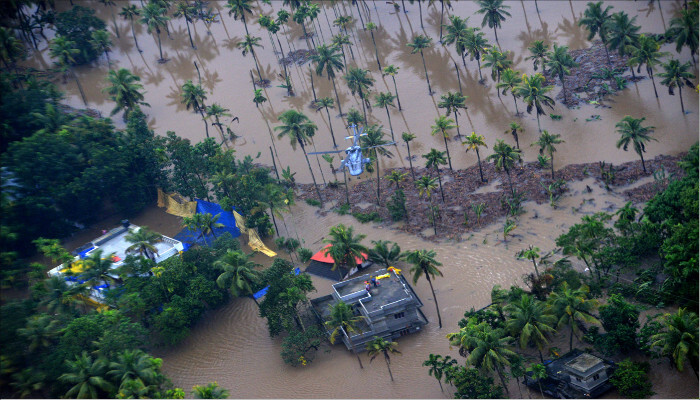 Air assets have been extensively utilised for winching up stranded personnel, transfer of stores, boats, and provision of relief material – especially food and water. 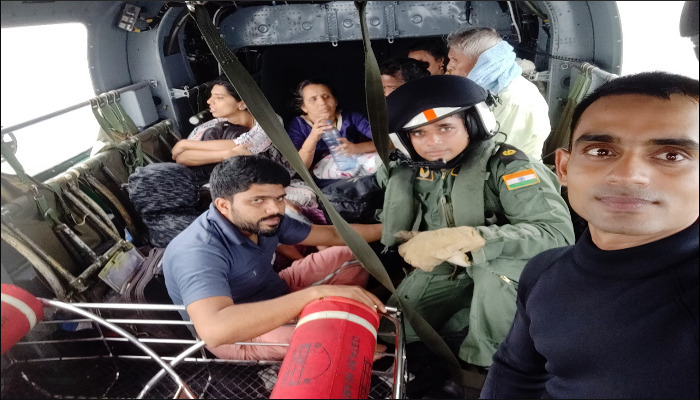 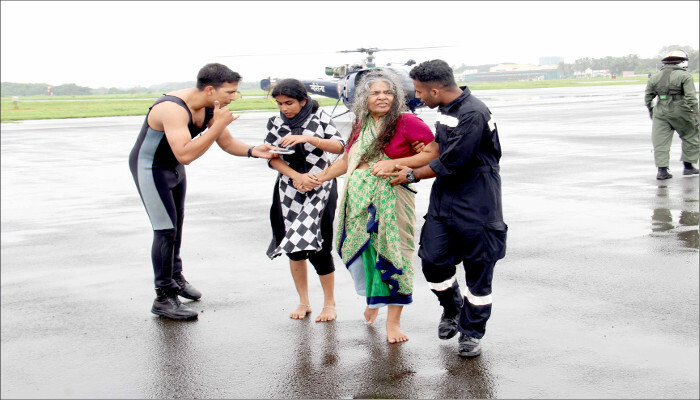 Various aircraft including ALH, Sea King, Chetak and MI 17 of the Indian Air Force rescued 59 people on 19 August 2018. 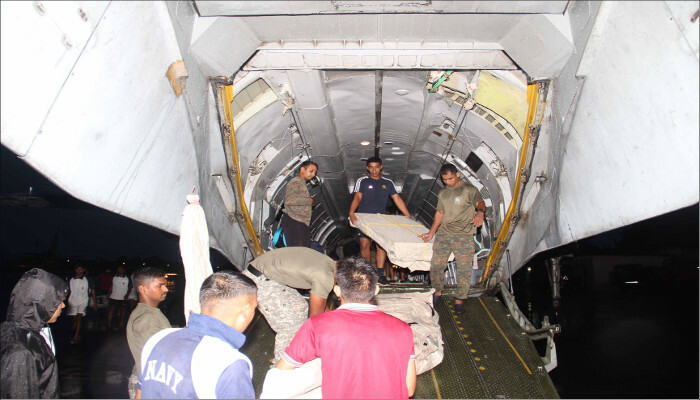 Over 800 kgs relief material comprising over one lakh food packets, along with bottled water and medicines, were also airdropped. 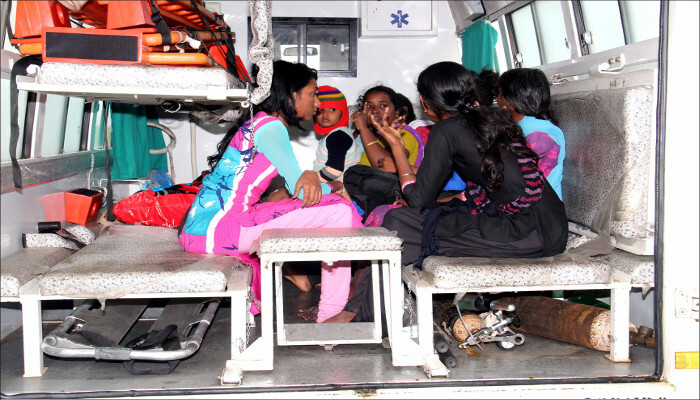 10 ladies in advanced stages of pregnancy were also airlifted to safety. 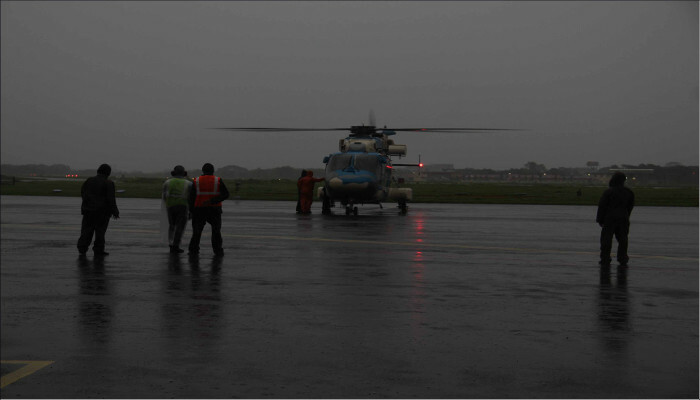 The Naval Air Station, Garuda has facilitated undertaking civil aviation operations from Naval Base, Kochi. 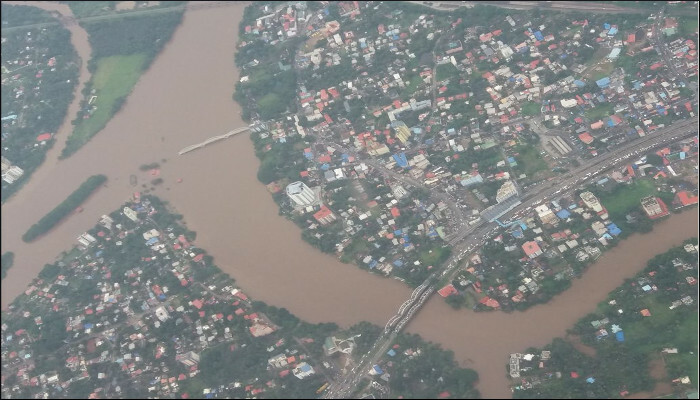 Commercial flights by Alliance Air using ATRs have commenceed between Bangalore and Cochin starting 20 August 2018. 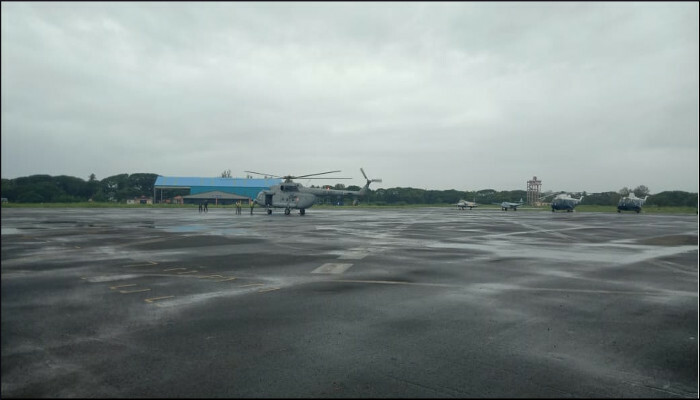 Other airlines are also expected to operate from the naval airfield till CIAL is ready to undertake flying operations. 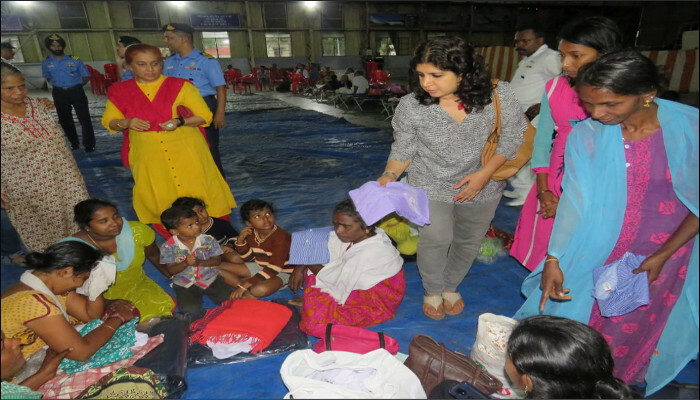 Approximately 250 rescued people are presently being accommodated at the T2 hangar inside the Naval Base, which has been converted into a make shift relief camp. 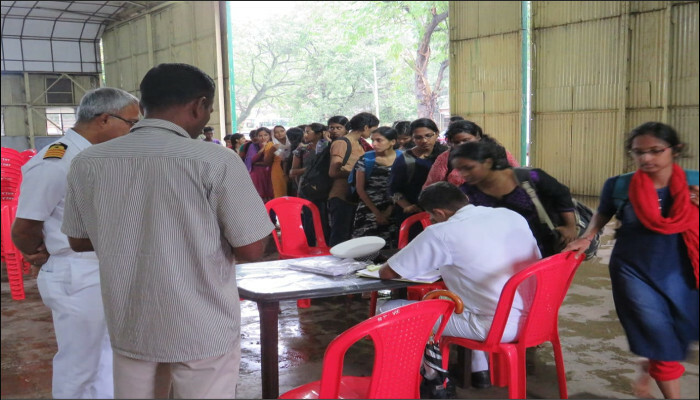 Another relief camp set up by the Naval Armament Depot, Aluva is catering for another 500 persons. 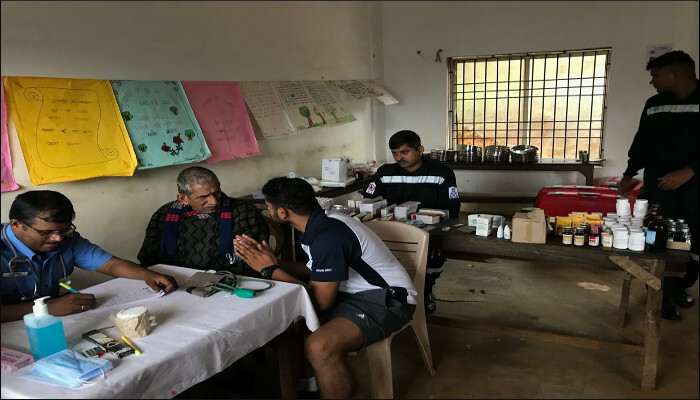 A medical camp has also been set up at the relief camp and two medical officers with their team are providing first aid and general OPD. 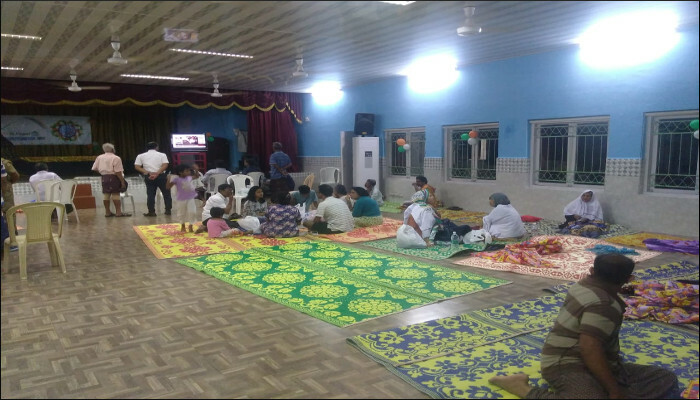 The Naval Kindergarten (NKG) School within the Naval Base has also been converted into a relief camp and approximately 170 persons have been accommodated there. 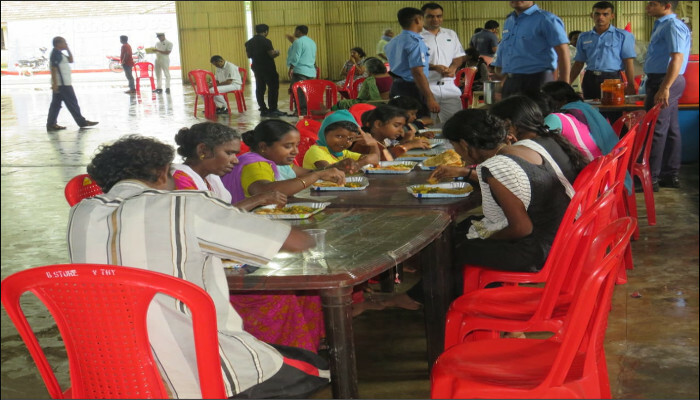 A community kitchen set up by INS Venduruthy in the campus of CUSAT is catering for 5,000 people. 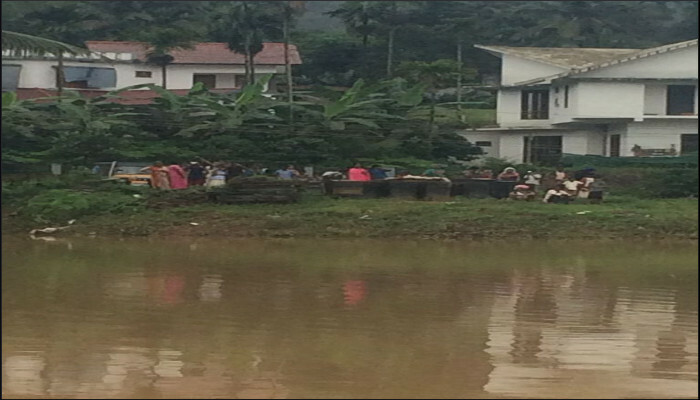 The demand for food includes 2,000 persons at UC College. 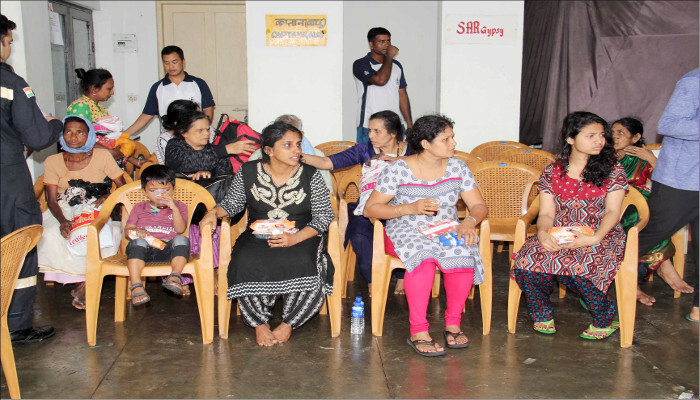 The state government authorities have also contributed to this kitchen, providing condiments and other edible items for its smooth functioning. 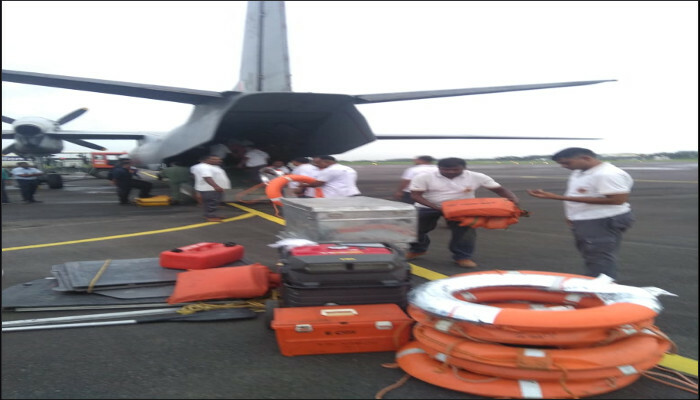 The Western Fleet tanker, INS Deepak arrived Kochi with fresh water and rations to augment the disaster relief efforts on 19 August 2018. 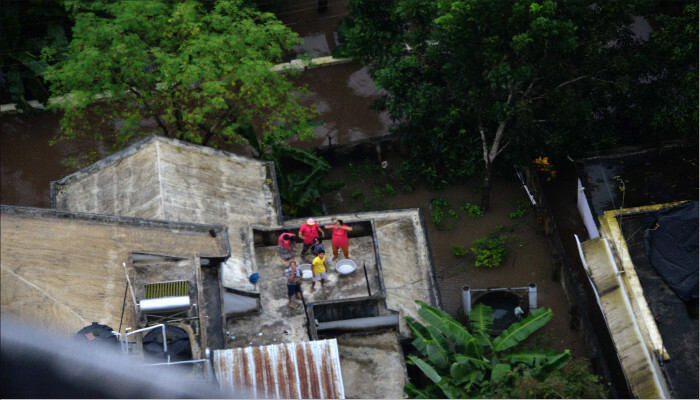 The ship disembarked water, fresh provisions, Ready to Eat Meals (MRE), and pouches of drinking water. 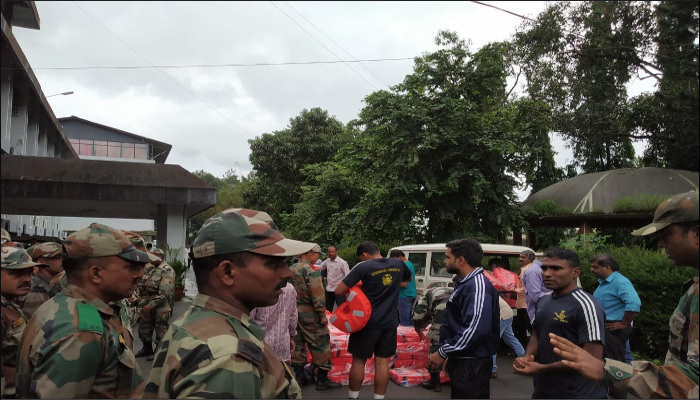 In addition, the Western Naval Command sailed INS Mysore with 70 tonnes of relief material which includes 30 tonnes of Bottled Water, 1,000 MRE, 10 tonnes of fresh ration, 5 tonnes of milk, 5.5 tonnes biscuits and other miscellaneous stores like medicines, and essential toiletries, phenyl, gash bags, bleaching powder, candles, etc. 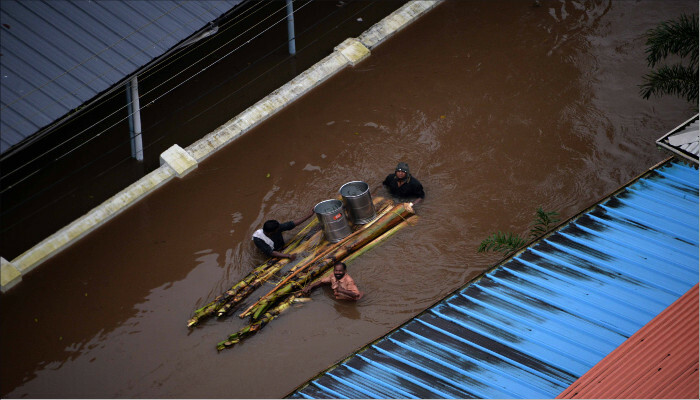 The relief material includes items received from some NGOs at Mumbai. 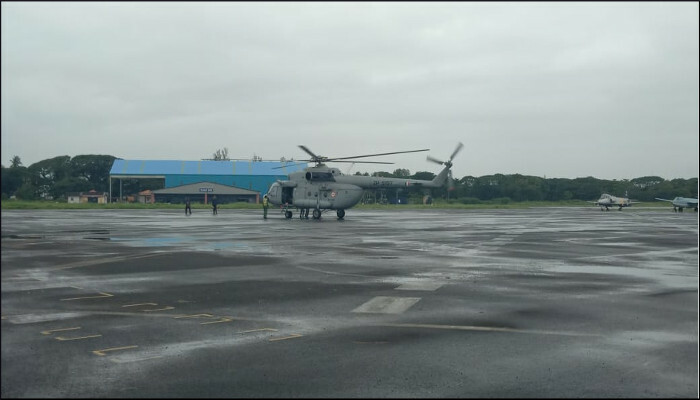 The ship is also carrying one Chetak helicopter for augmenting air effort of Southern Naval Command. 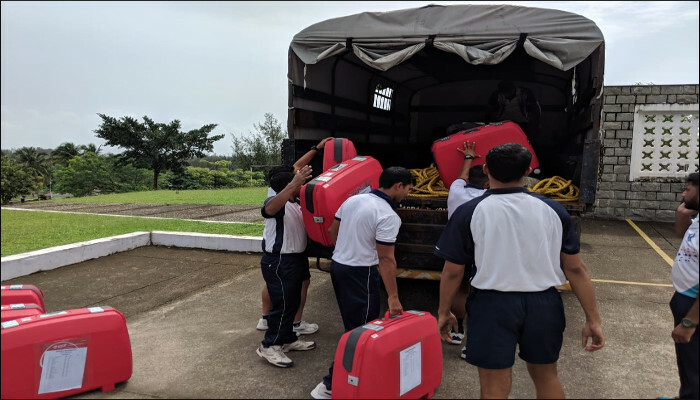 INS Sharda with 15 tonnes of fresh rations departed Karwar 19 August 2018 for Kochi. 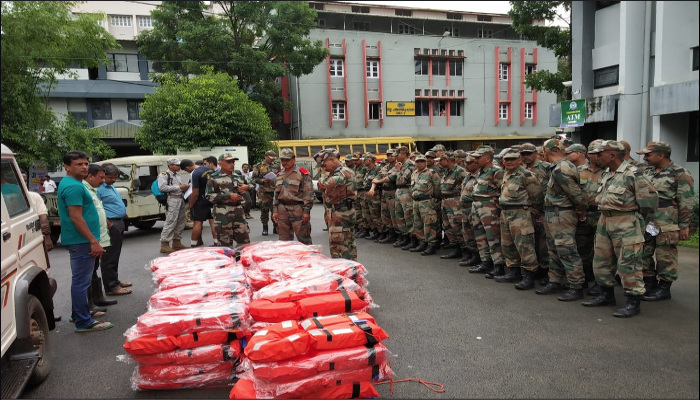 INS Mumbai is also being loaded with relief material and will depart for Kochi on 20 August 2018. 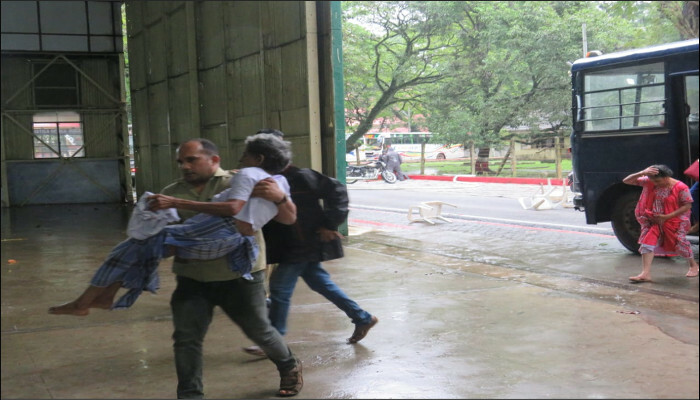 Amrita Institute of Medical Sciences requested for help from SNC late night on 17 August 2018 for repairing its defective water pumps that had caused disruption in water supply. 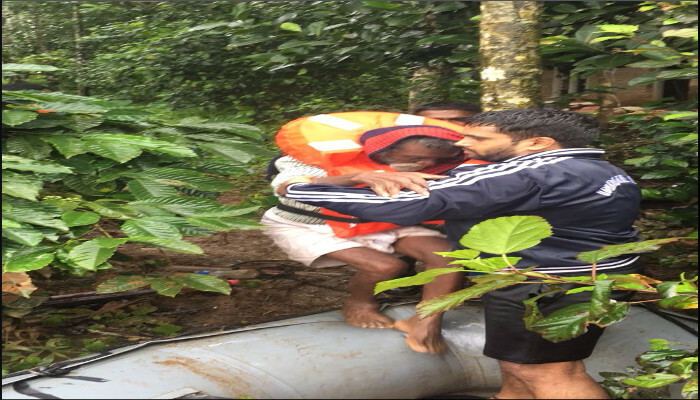 A team from the Naval Ship Repair Yard, Kochi fashioned a small life raft using some pipe material to reach the location and replaced three pumps with those held in the Naval inventory. 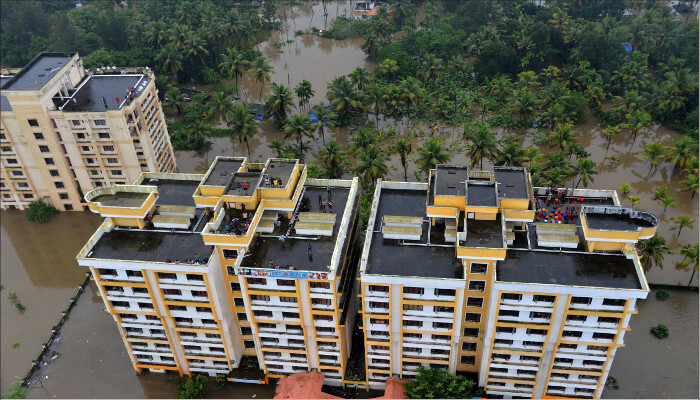 The pumps were totally non-operational and the starters were submerged in water. 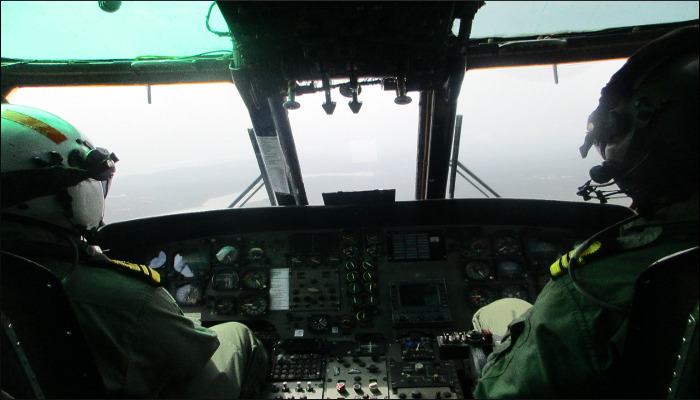 The team also repaired the starters, to get the system operational in a matter of 10 hours. 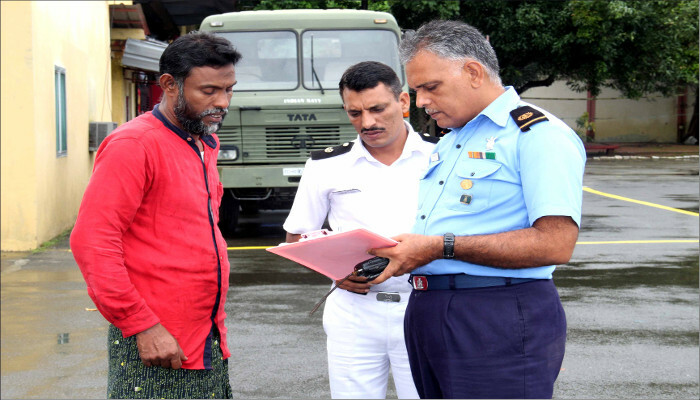 Southern Naval Command continued with heightened deployment of teams and assets for Operation Madad for the ninth day – 18 August 2018. 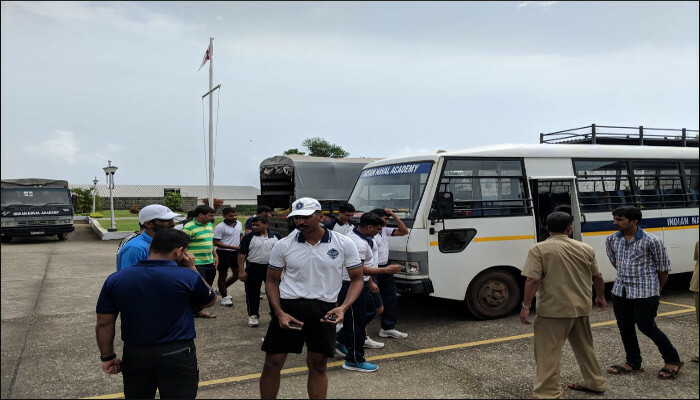 SNC rescue teams have been augmented by Gemini boats, divers and other resources from both Western and Eastern Naval Commands of the India Navy. 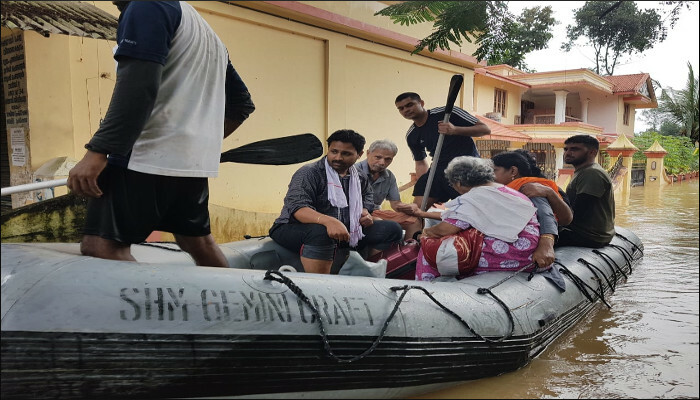 72 rescue and diving teams with Gemini boats have been deployed in various parts of Kerala. 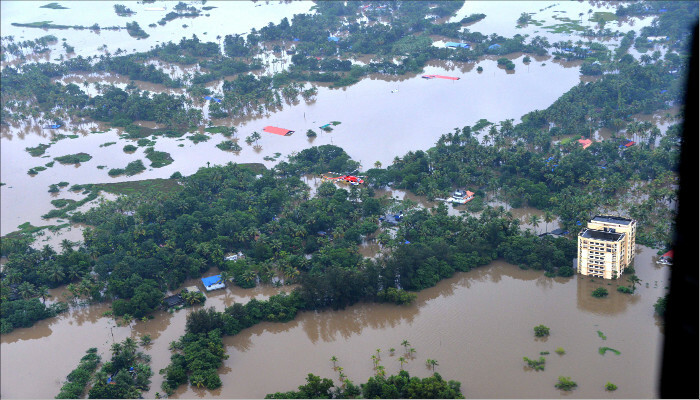 42 teams with one Gemini boat each are deployed in Ernakulam district at various places. 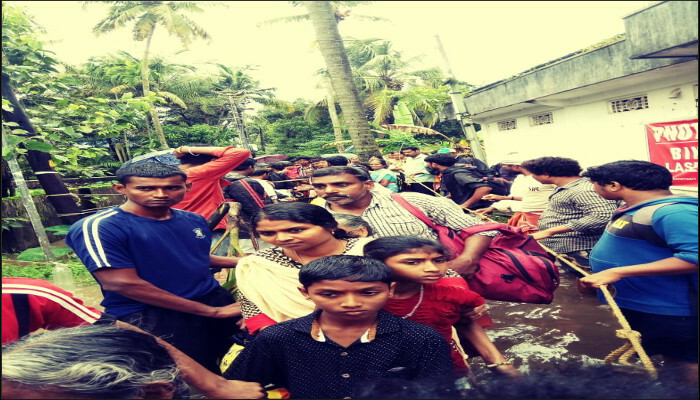 One team is at Pizhala island, one at Edapally, three at Perumbavur, 16 at North Paravur, 14 at Aluva, four at Muvattupuzha and two at Kadangallur. 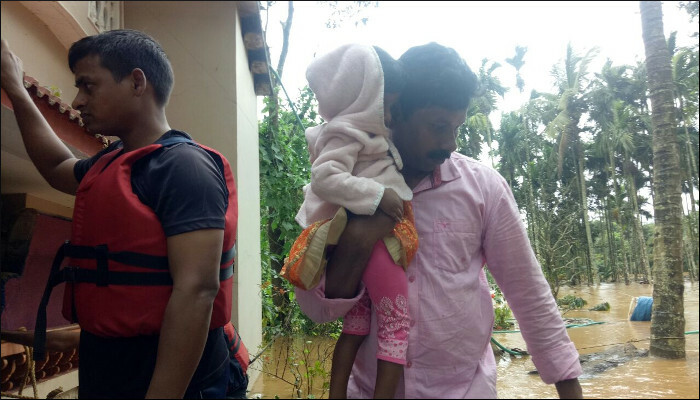 10 teams each have been deployed at Chalakkudy and Chengannur, two at Porunnannur and one team each at Ayroor and Pullad. 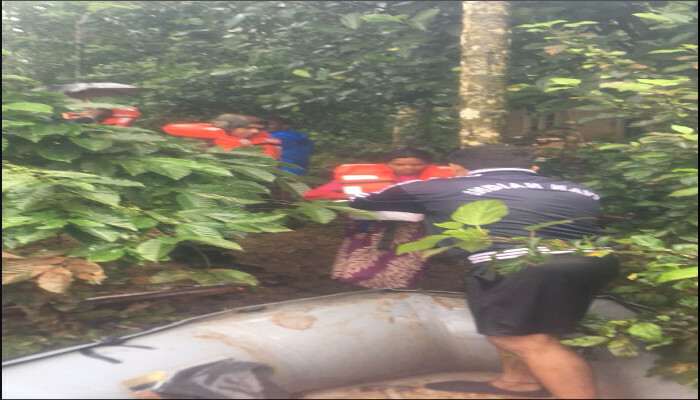 The teams recued over 3,375 people by boats on 18 August 2018. 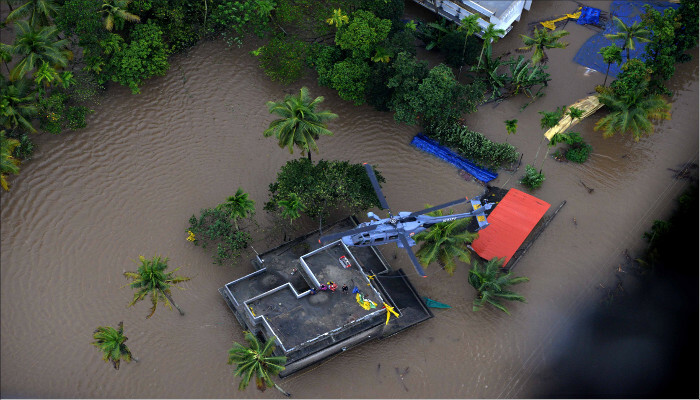 Air assets have been extensively utilised for winching up stranded personnel, transfer of stores, boats and relief material. 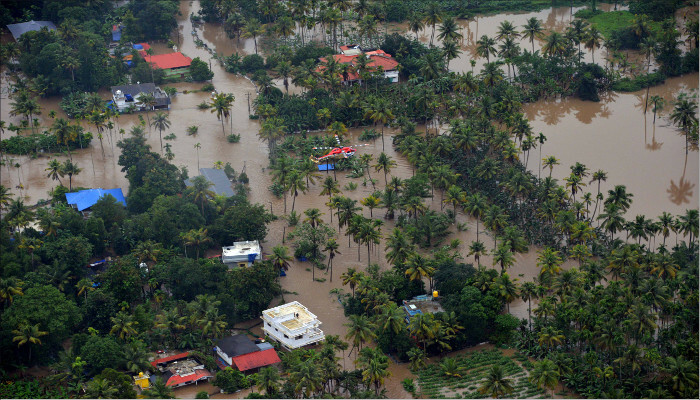 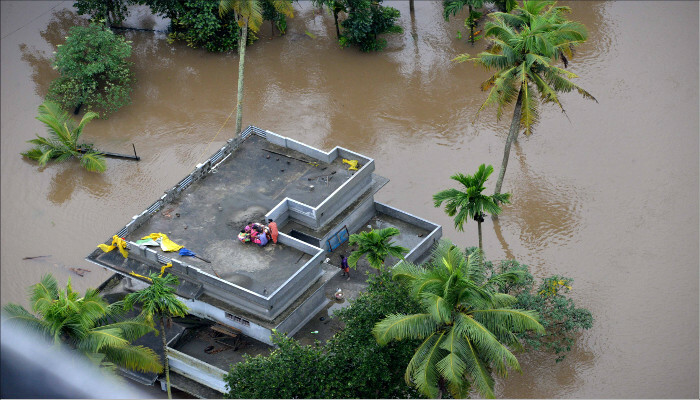 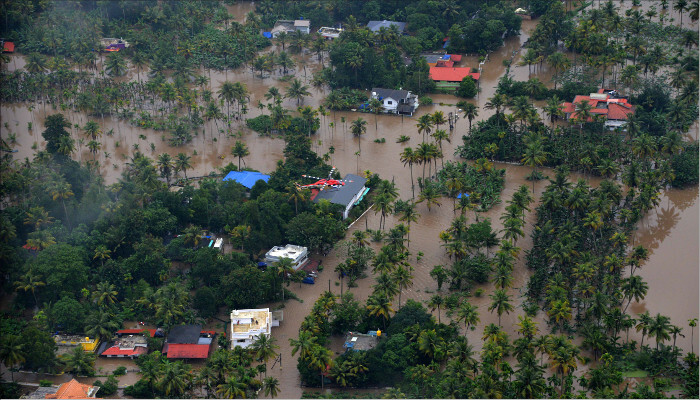 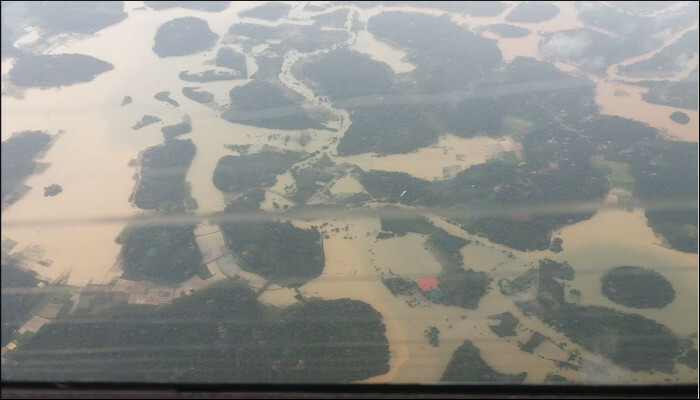 Air rescue has been carried out at various places of the three severely affected districts of Thrissur, Ernakulam and Pathanamthitta. 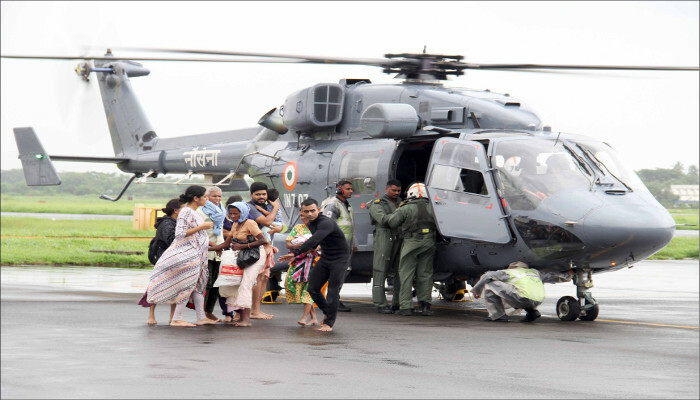 Various aircraft including ALH, Sea King, Chetak and MI 17 of the Indian Air Force were able to rescue more than 154 people. 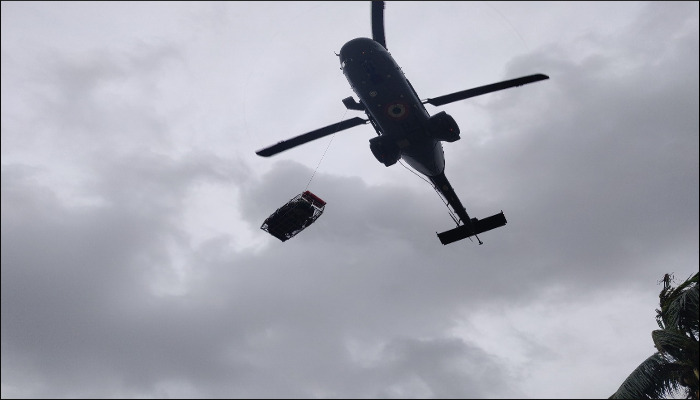 Food packets along with bottled water were also airdropped on the roof tops. 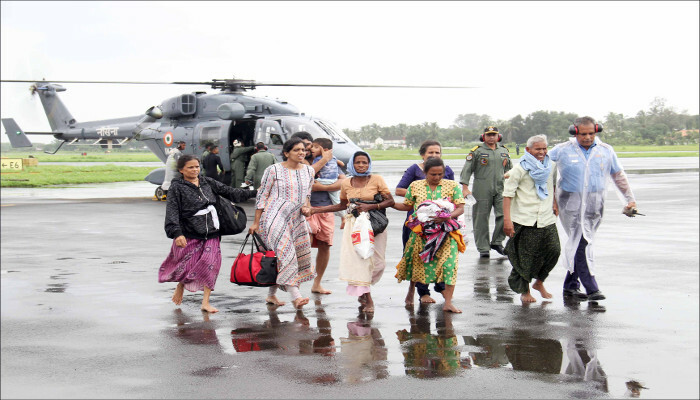 Over 350 rescued people have been accommodated in the T2 hangar inside Naval Base, which has been converted into a make shift relief camp. 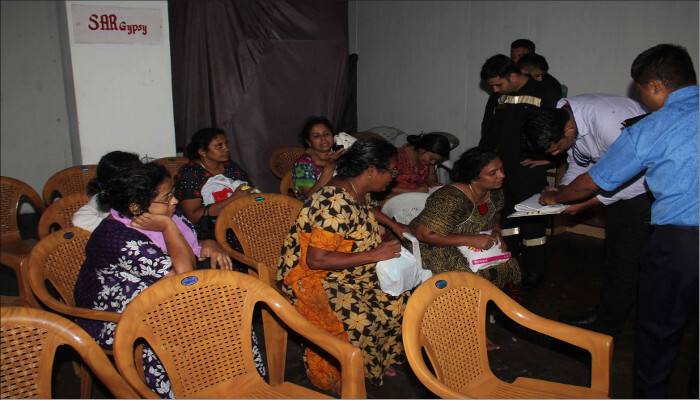 Another relief camp set up by the Naval Armament Depot, Aluva catered to 170 persons. 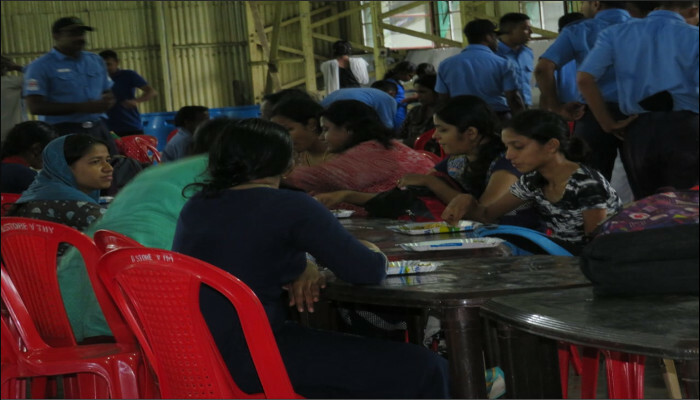 The Naval Kindergarten (NKG) School within the Naval Base has also been converted into a relief camp and approximately 250 persons have been accommodated there. 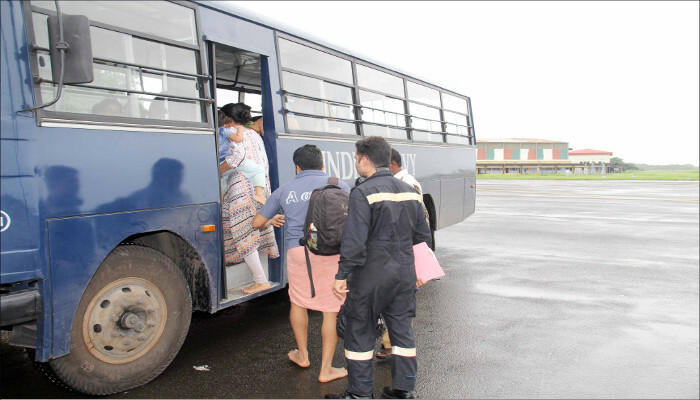 Two Kendriya Vidyalayas, close to the Naval Base and administered by SNC, have also been kept standby as an additional relief camps to house more displaced persons. 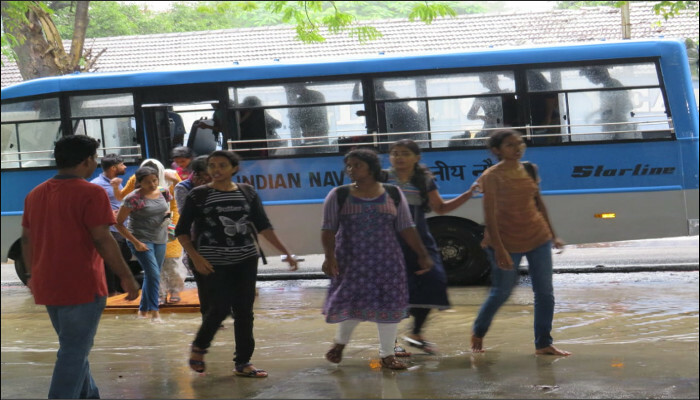 A community kitchen set up by INS Venduruthy at Cochin University of Science and Technology is catering for 7,000 people. 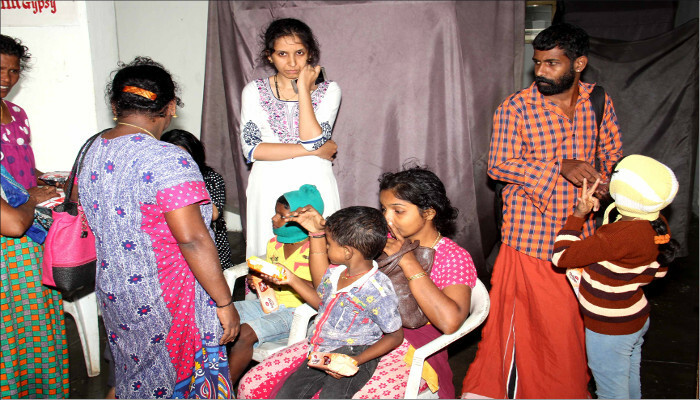 The state government has contributed to this kitchen, providing condiments and other edible items for its smooth functioning. 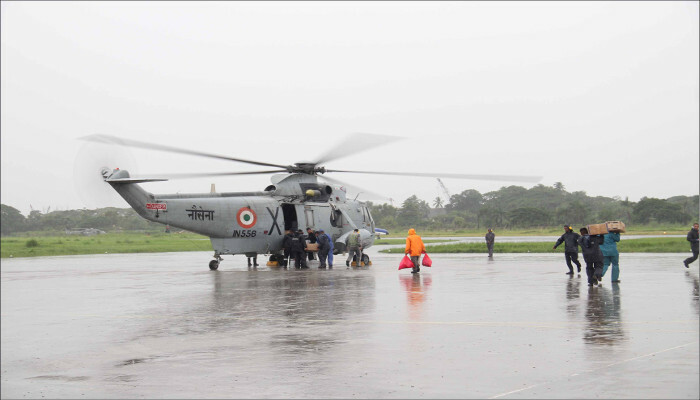 The Hon’ble Prime Minister of India, Shri Narendra Modi visited Kochi on 18 August 2018 to survey flood affected areas and review the rescue operations being undertaken by various agencies, including the Indian Navy. 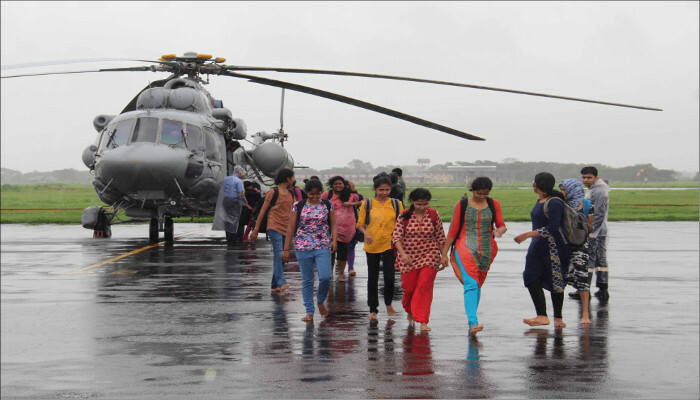 Southern Naval Command continued with heightened deployment of teams and assets for Operation Madad for the eighth day – 17 August 2018. 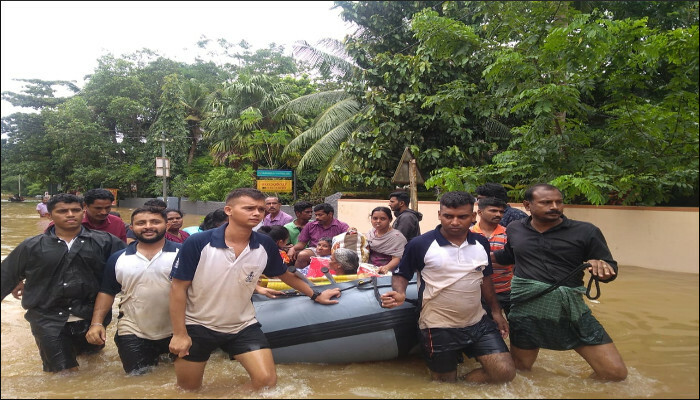 58 rescue and diving teams with Gemini boats have been deployed in various parts of Kerala. 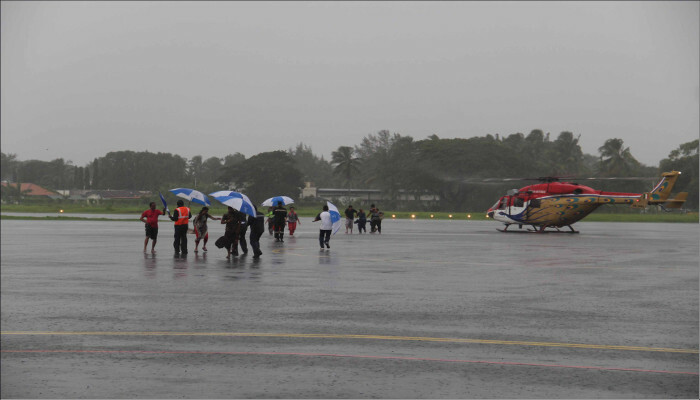 19 diving and rescue teams with Gemini have been augmented by the Western and Eastern Naval Commands. 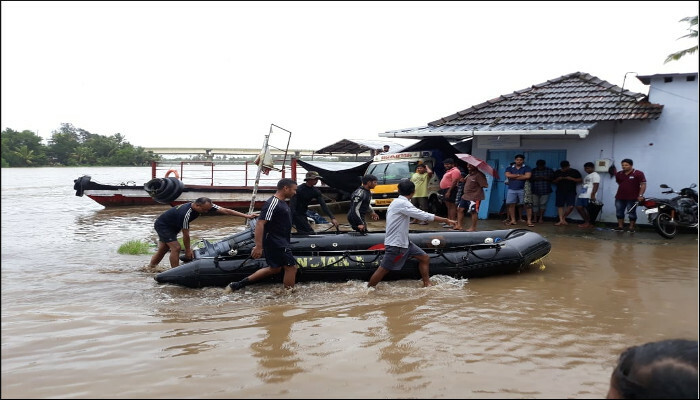 More than 3,000 people have been rescued and continuous efforts are on to bring the flood affected people to safety and provide them essential relief supplies such as food and water. 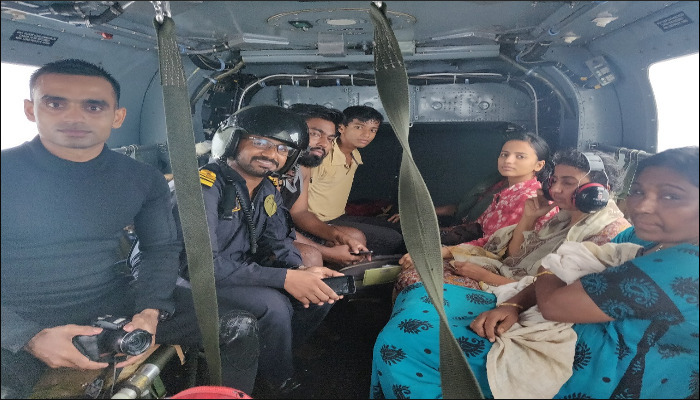 On 17 August 2018, 310 people were rescued by boats and 176 by aircraft. 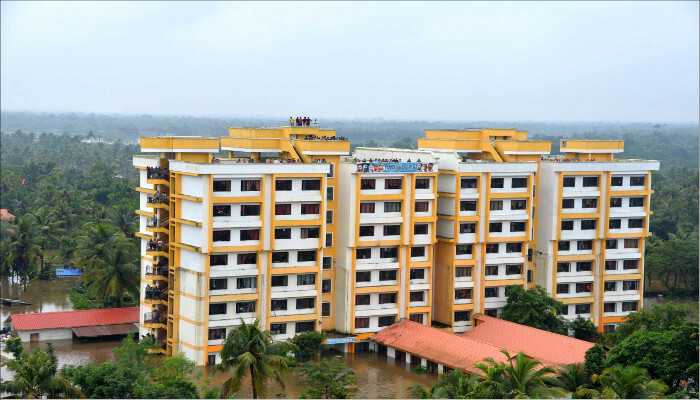 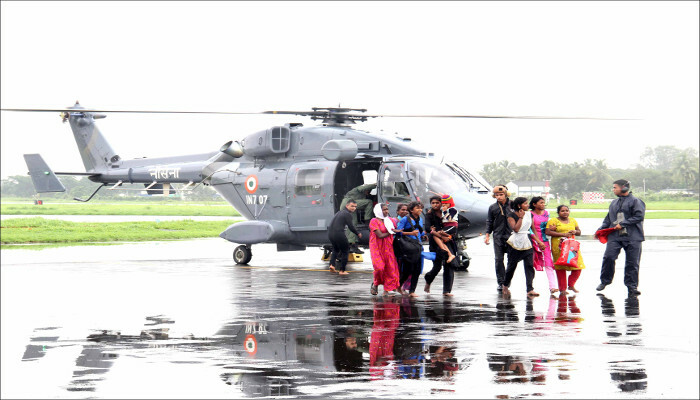 About 500 rescued people have been accommodated inside the naval base, before shifting them to a relief camp at Fort Kochi. 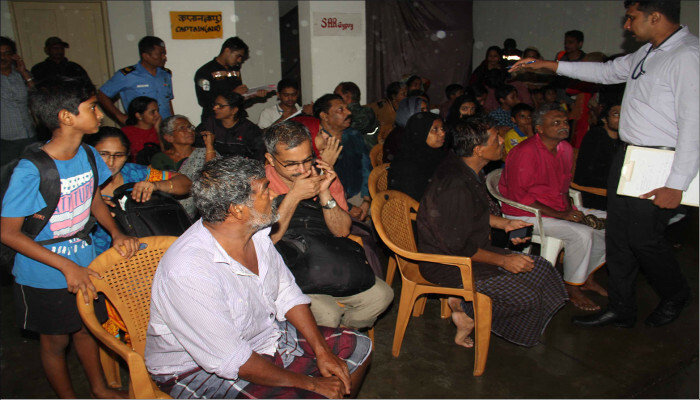 Meanwhile, the rescue camp at Aluva is catering to 151 people. 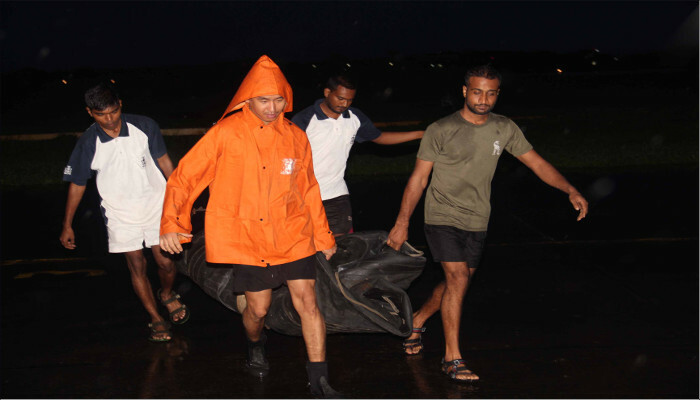 Relief material comprising 1,000 raincoats, 1,300 gum boots, 264 lifebuoys and 1,000 life jackets have been augmented by the WNC and ENC. 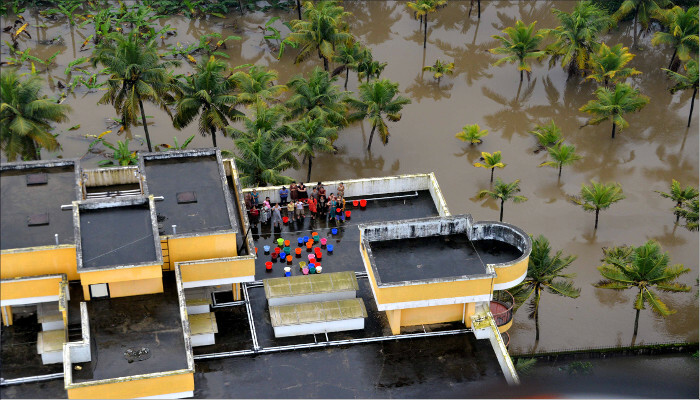 37 teams with one Gemini boat each are deployed in Ernakulam district at various places. 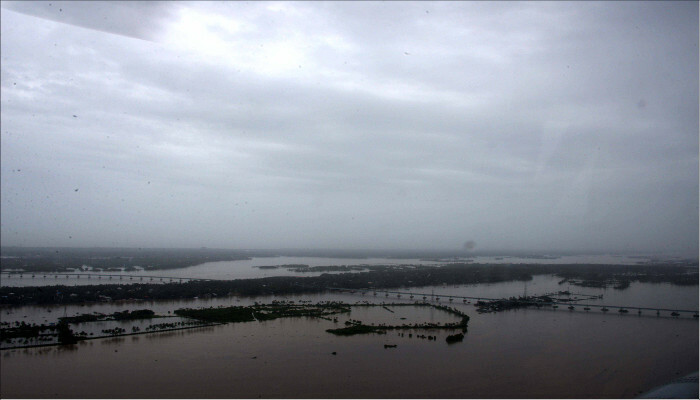 One team is at Pizhala Island, one at Edapally and three at Perumbavur. 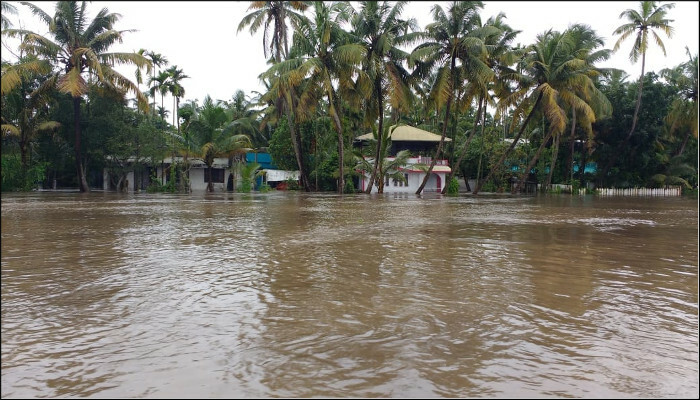 16 teams have been deployed at North Paravur, 12 at Aluva and four at Muvattupuzha. 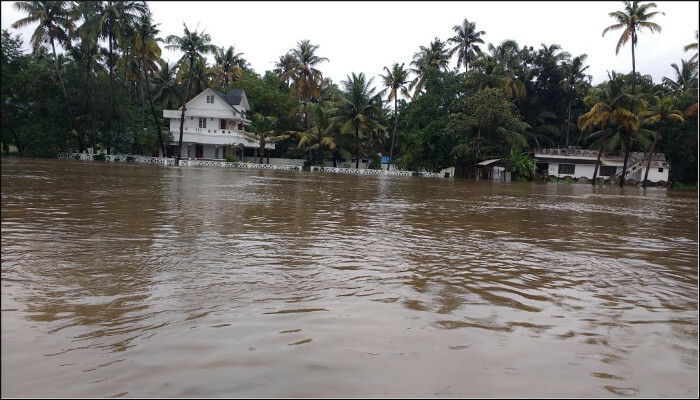 In Thrissur district, nine teams have been deployed at Chalakkudy, four teams at Chengannur and one team each at Ayroor and Pollad. 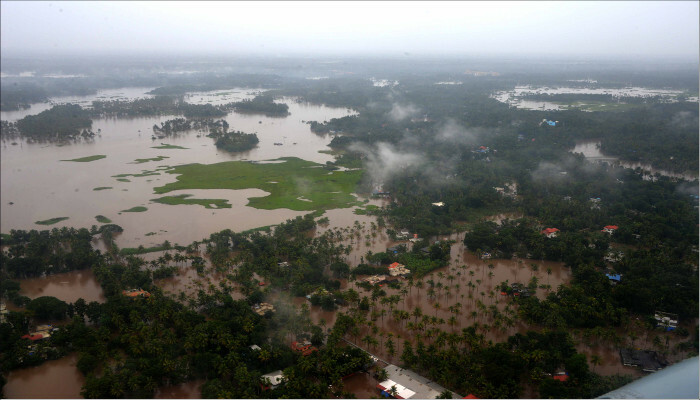 One team is positioned at Kottayam. 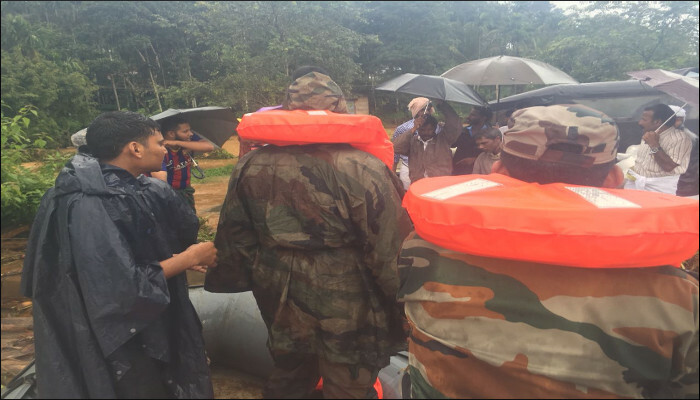 Five naval teams with Gemini boats are at various places in Wayanad district continued with relief operations. 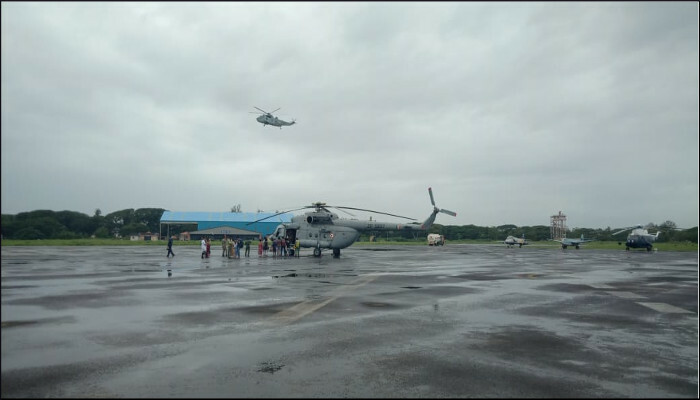 In addition, all air assets available at INS Garuda have been extensively utilised for evacuating stranded personnel, transfer of stores, boats and relief material. 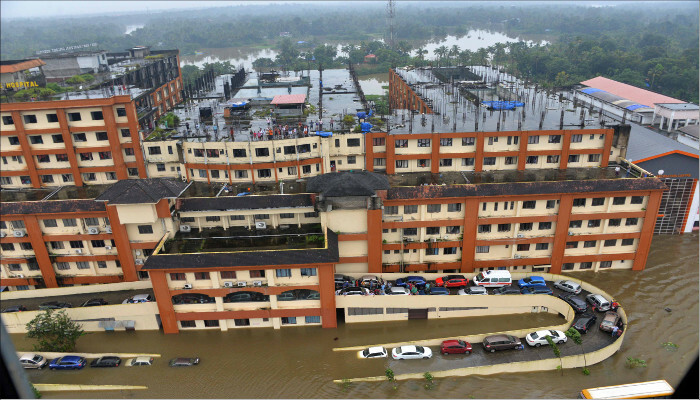 INS Venduruthy set up a community kitchen at Cochin University of Science and Technology to cater for 3,000 people. 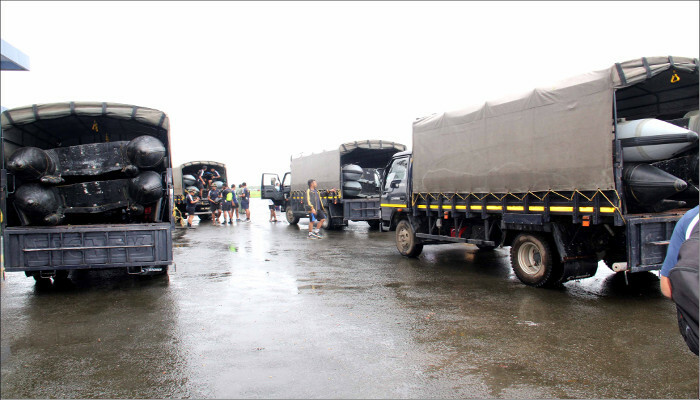 Southern Naval Command continued the heightened deployment of teams and assets for Operation Madad on the seventh day - 16 August 2018. 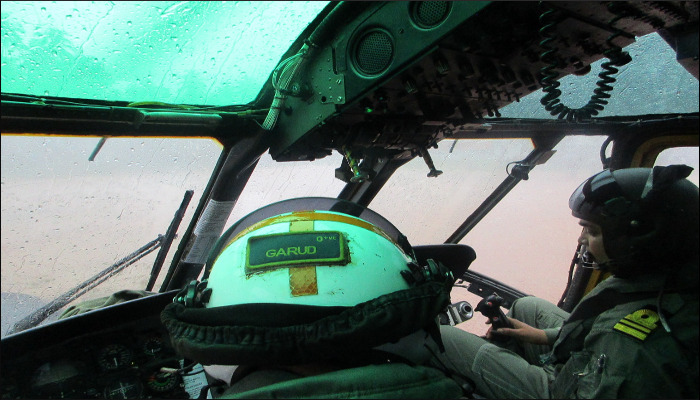 A total of 40 rescue and diving teams with Gemini boats are undertaking rescue operations at multiple locations. 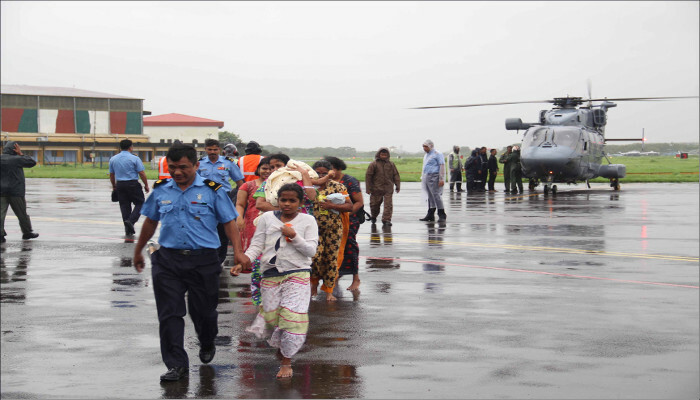 Over 200 people were rescued on 16 August 2018 by air effort, while many more were rescued by the boats deployed. 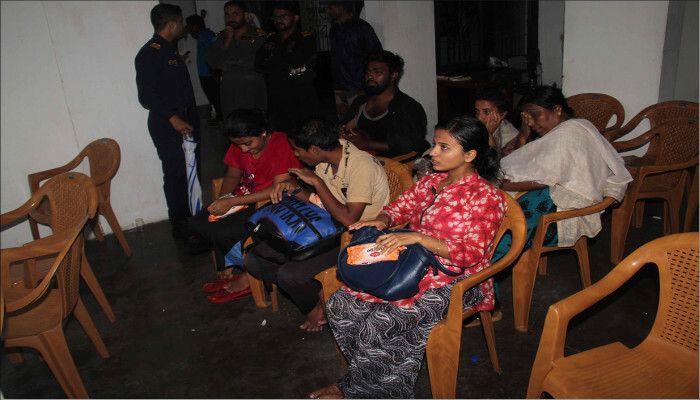 Rescued people were also provided food and shelter inside naval base in addition to the camp at Aluva. 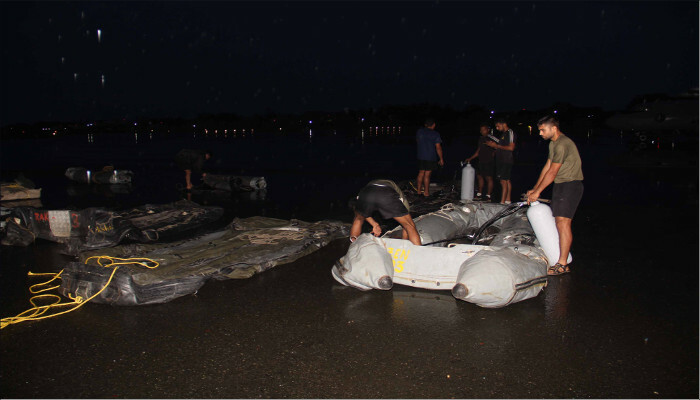 All the boats and divers at the disposal of SNC have been committed to this operation and more boats and divers have been requisitioned from other Naval Commands. 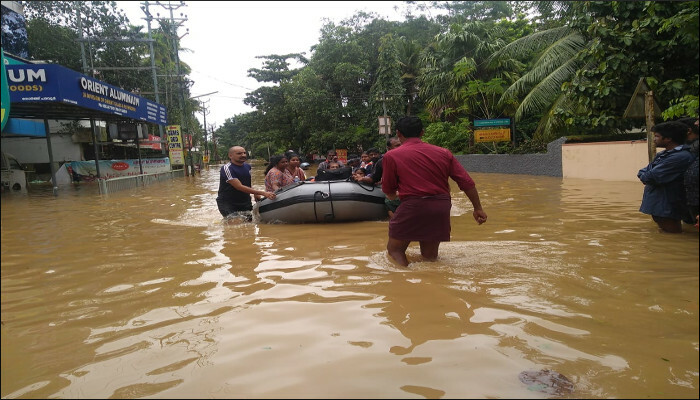 Twenty seven teams with one Gemini boat each are deployed in Ernakulam district at various places. 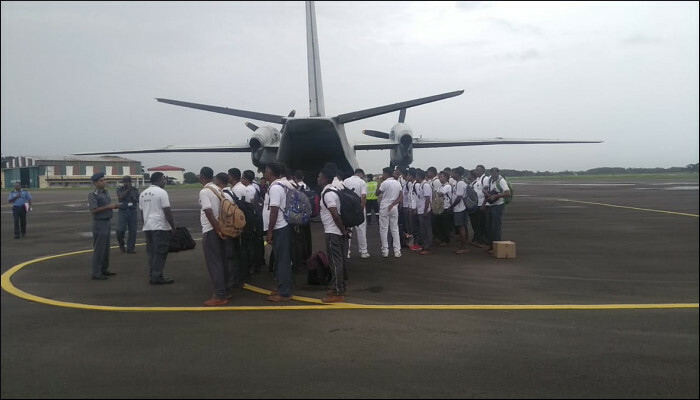 One team is at Pizhala Island, one at Edapally and three at Perumbavur. 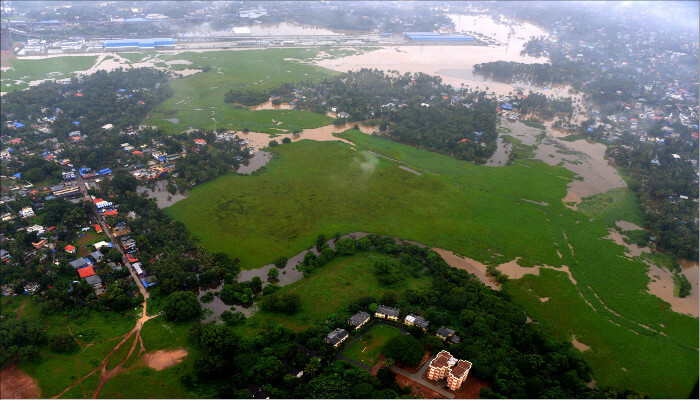 North Paravur has been augmented with five more teams, taking the total number deployed to seven. 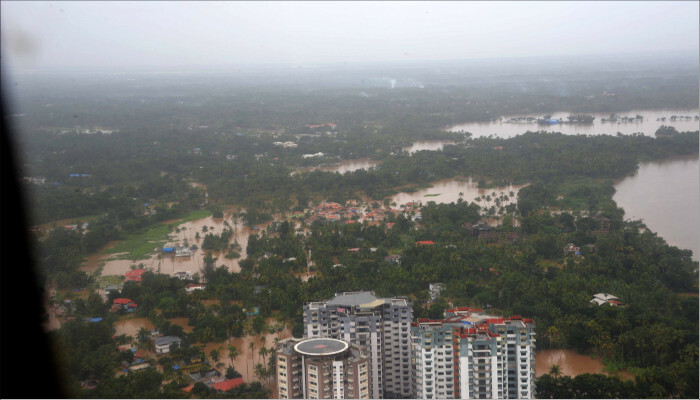 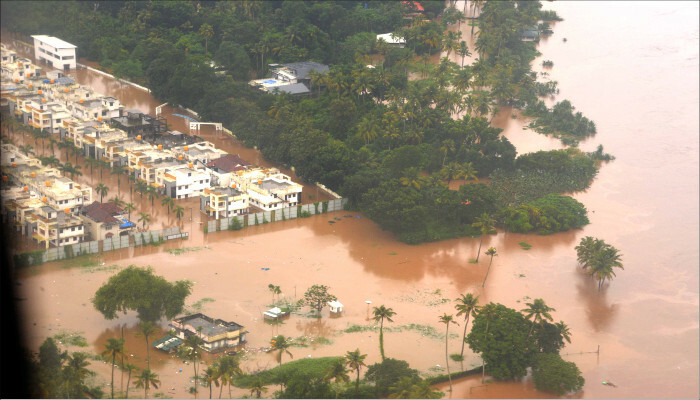 Eleven rescue teams are employed at Aluva. 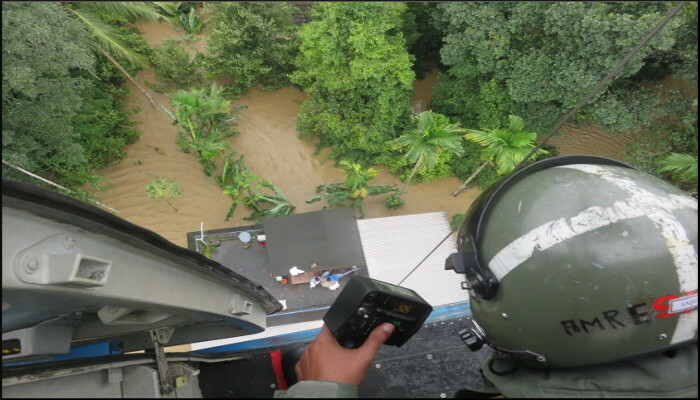 Two of these teams were able to rescue 25 police personnel at Opal. 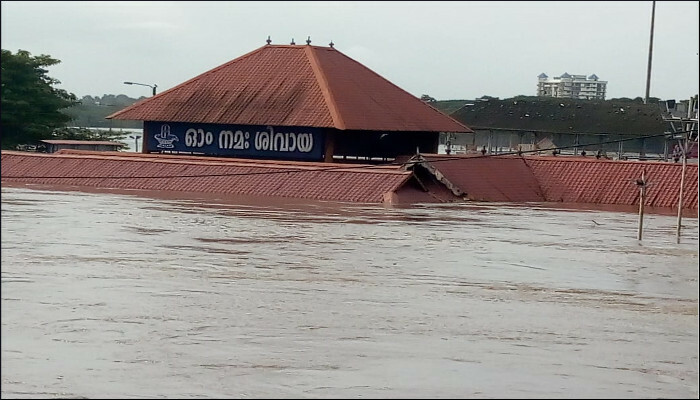 Four teams are positioned at Muvattupuzha for rescue efforts urgently required there in light of the Periyar being in flood. 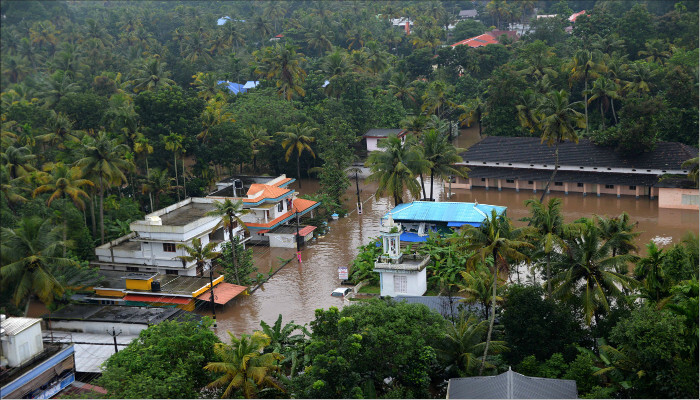 In Thrissur district, a total of five teams are deployed at Chalakkudy. 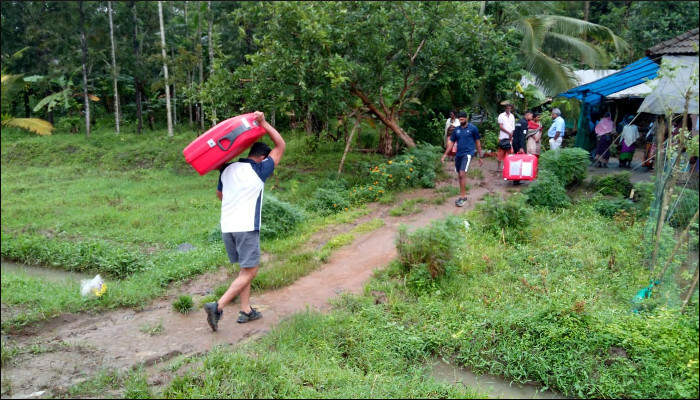 In Pothanamthitta district, three teams, one each at Ayroor, Pollad and Kozhencherry, are deployed. 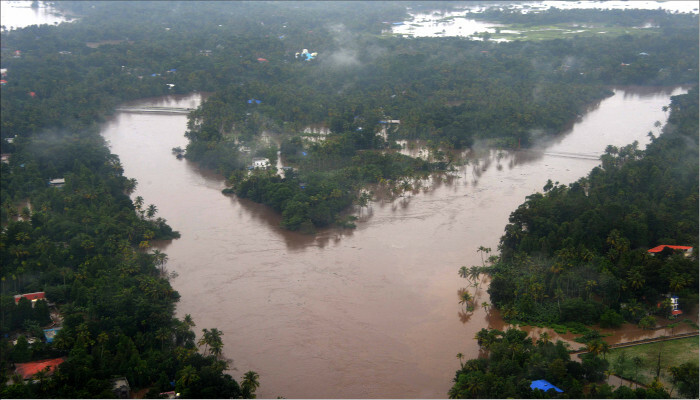 One team is positioned at Kottayam. 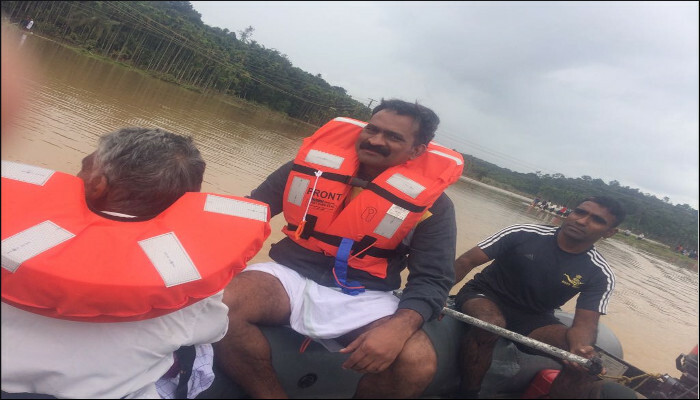 Five naval teams with five Gemini boats are deployed at different places in Wayanad district. 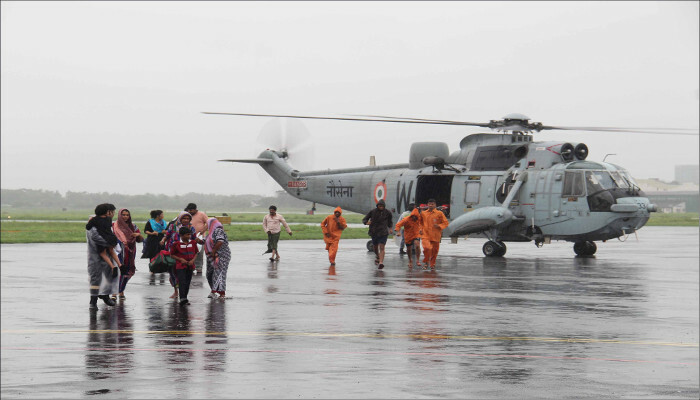 In addition, all air assets available at INS Garuda have been extensively utilised for winching up stranded personnel, transfer of stores, boats, relief material, etc. 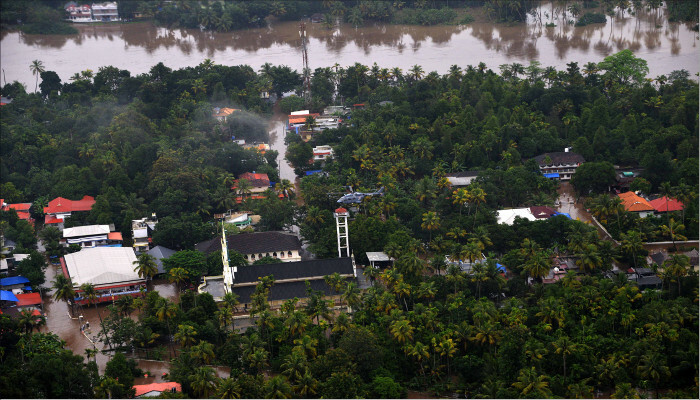 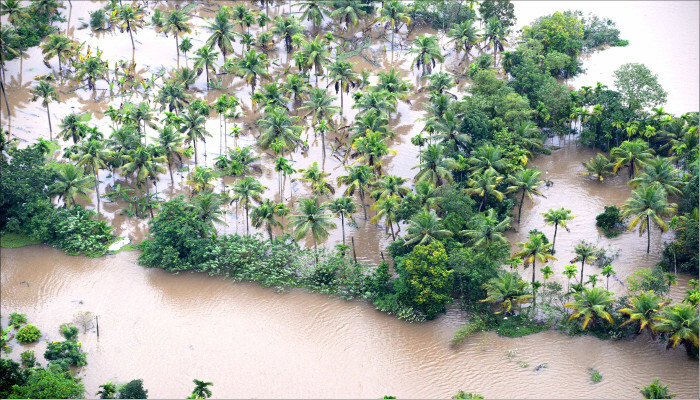 Air rescue has been carried out at Chalakkudy, Kalady, Aranmula, Bilakamadu and Palliyuda. 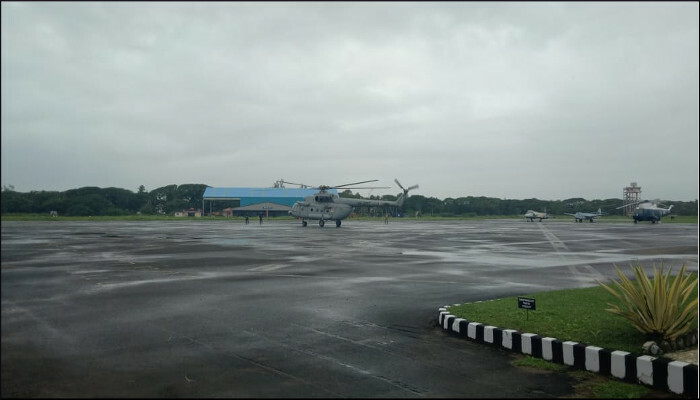 Three districts namely, Thrissur, Ernakulam and Pathanamthitta were extensively covered by various aircraft including ALH, Sea King, Chetak and MI 17 of the Indian Air Force. 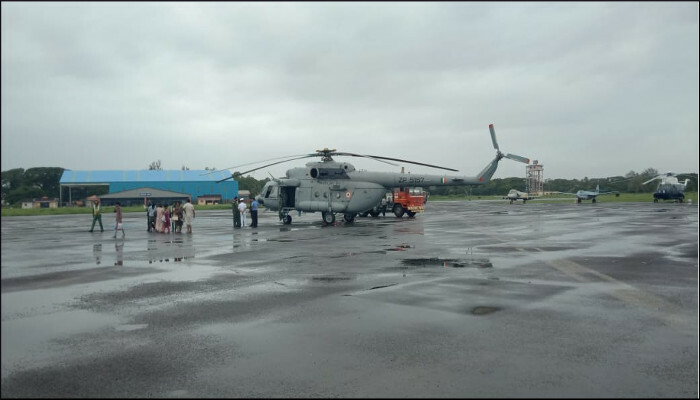 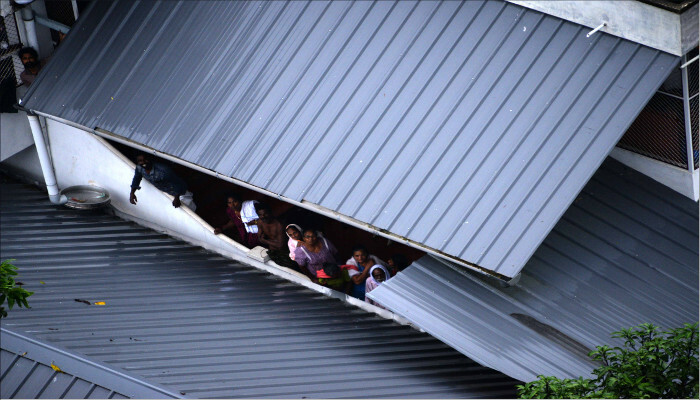 A make shift relief camp has been set up at the T2 Hangar inside Naval Base, Kochi and people rescued through air effort were provided with food, bedding and other necessities. 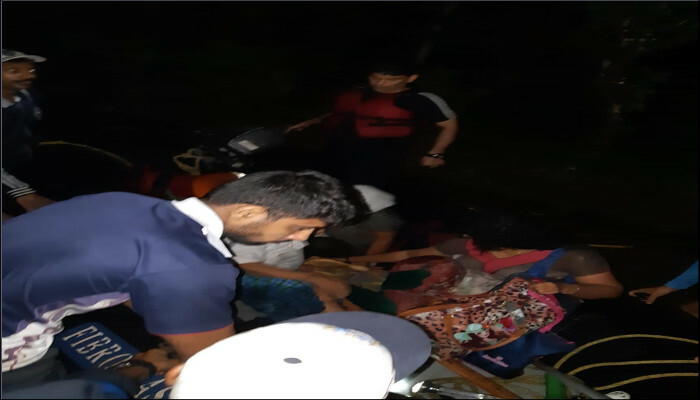 Based on a request received from District Collector, relief material such as food, candles and some essential items were air dropped to help out approximately 1,500 patients stranded at Narayana Institute of Medical Sciences, North Paravur. 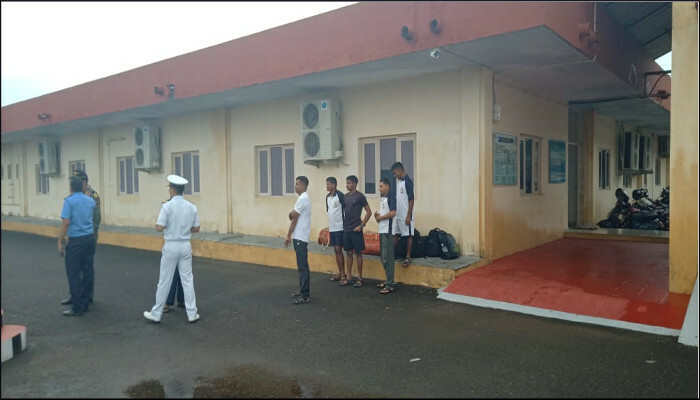 Southern Naval Command continued with the deployment of teams and assets for Operation Madad on the sixth day - 14 August 2018. 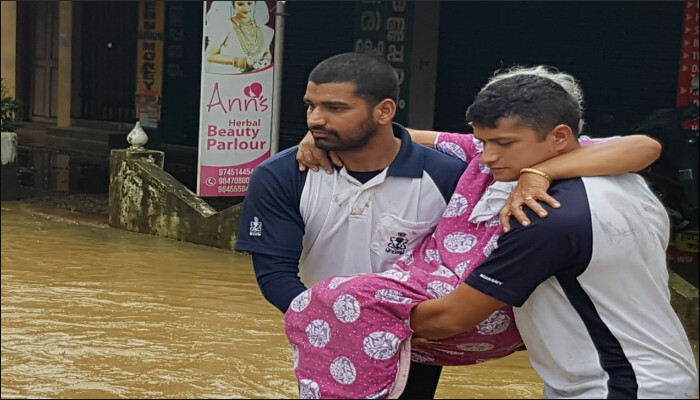 Indian Navy teams continued to be standby at their respective locations at the directives of the state administration in various parts of Kerala, to provide assistance at short notice to flood affected people. 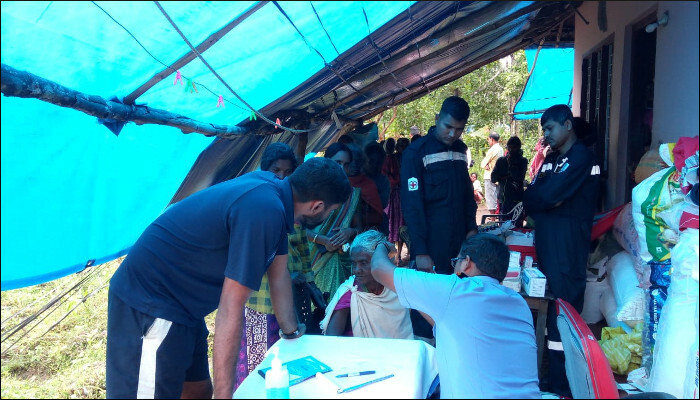 In Wayanad, the teams undertook road opening at Payampalli village and set up medical camps at remote and most affected areas (Thrishilery village, Puthlyoor and near bank of river Kabini) and attended to over 30 patients. 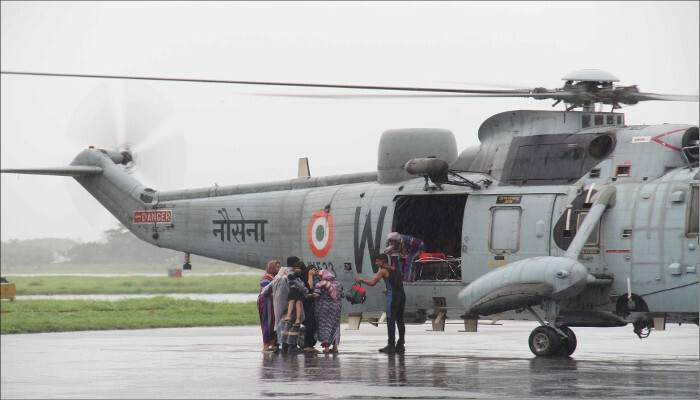 In addition, Indian Navy also aided the Civil Administration in shifting of relief material. 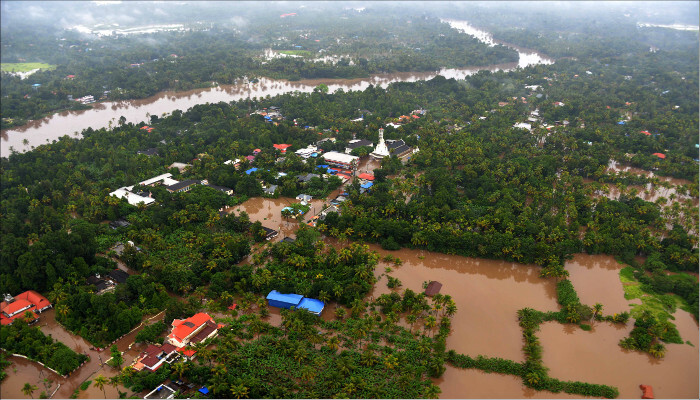 Five diving teams (one at Pizhala Island, one at Aluva and three at Perumbavoor) are available at the directives of district Collector Ernakulam to provide assistance to the local populace for possible deteriorating situation arising from inclement weather. 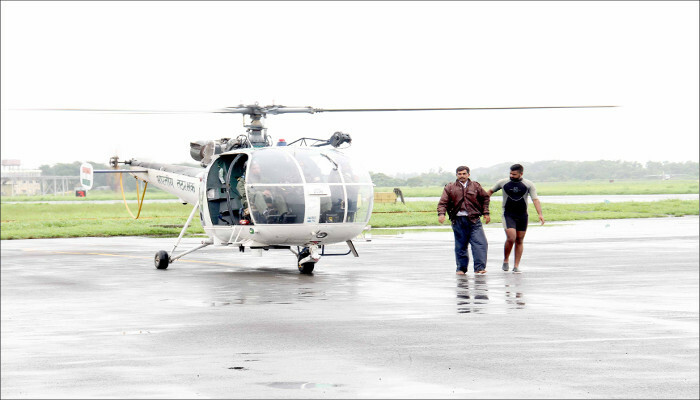 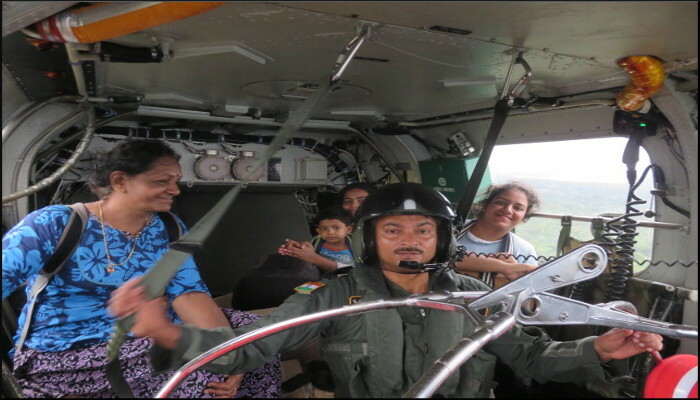 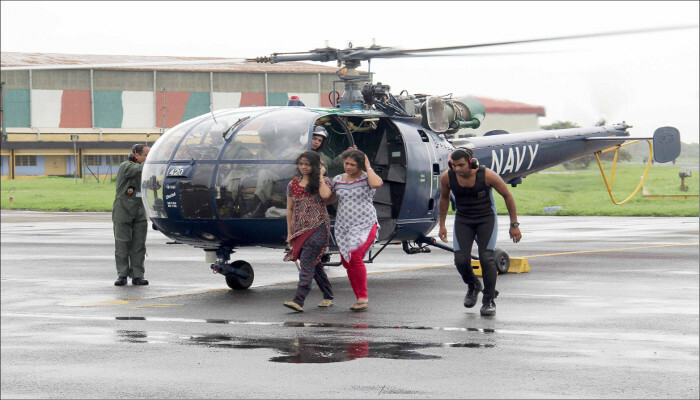 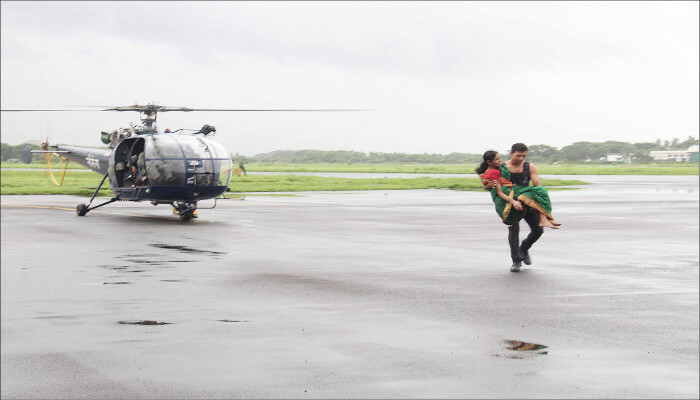 Regular aerial sorties are also being carried out for survey of flood affected areas as well as transportation of personnel and relief material. 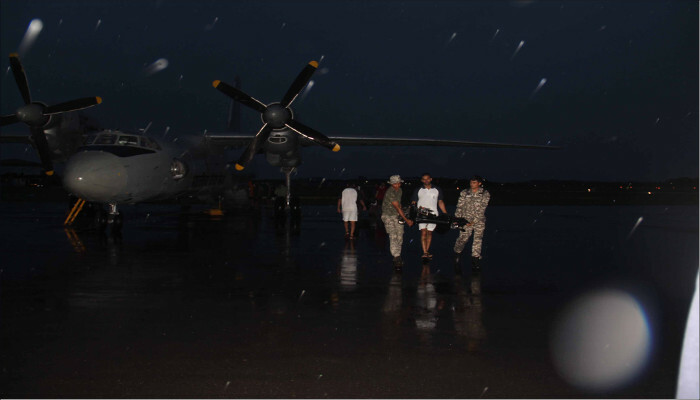 Southern Naval Command continued with the deployment of teams and assets for Operation Madad on the fifth day - 13 August 2018. 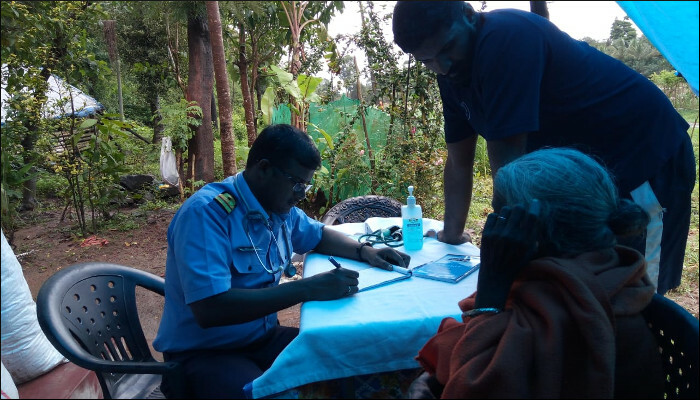 Five naval teams are deployed at different places in Wayanad district and are involved in conduct of medical camps and road opening along Chundel to Mupainad, Muttil to Meppadi and Lakkidi to Pozhuthana routes. 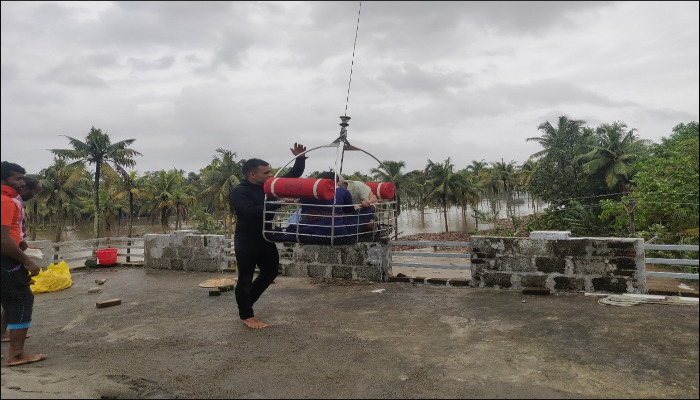 Two diving teams with Gemini boats have been dispatched by road in addition to the existing five, as Banasura Dam gates have been opened to release water and as more rains are expected. 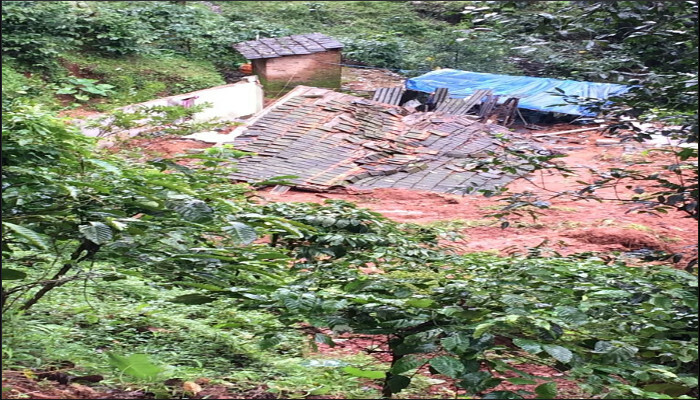 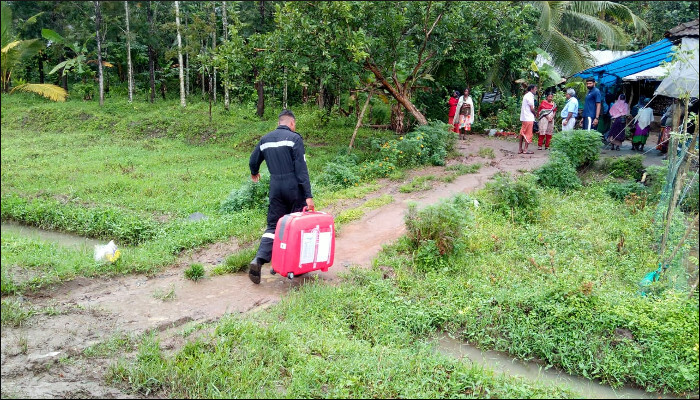 Based on request from Civil Administration, some of the rescue teams at Wayanad have been diverted to set up a Medical Camp at remote areas not accessible by road. 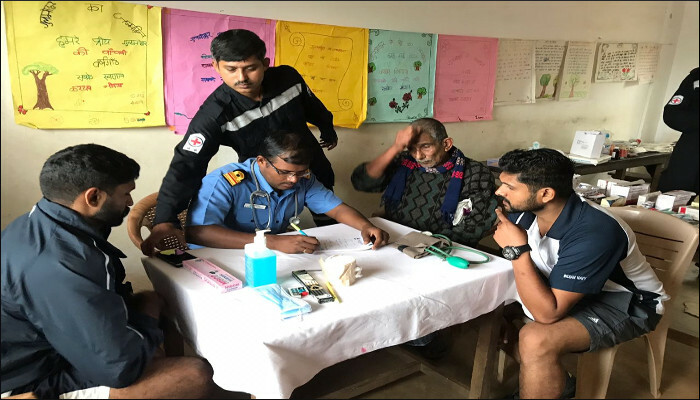 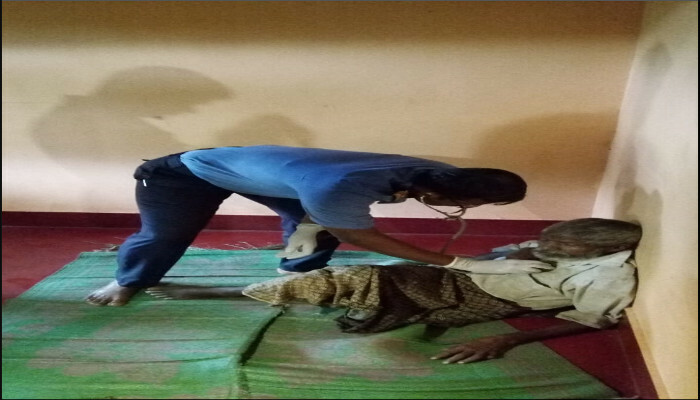 The naval team set up a medical camp first at Thrishilery (07 kms Northeast of Mananthwady) and subsequently at Puthiyoor near the banks of Kabini river and attended to over 50 patients. 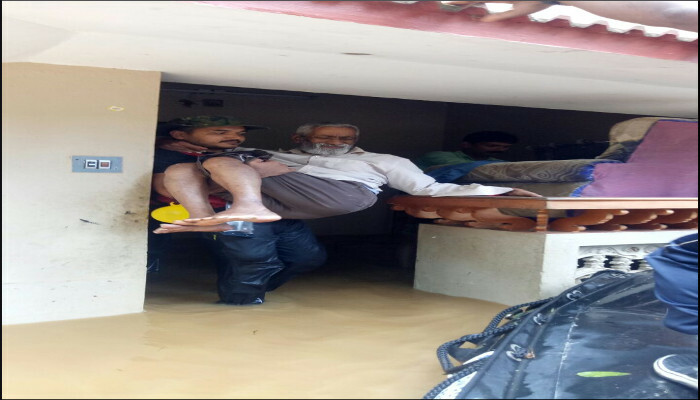 Five diving teams are standby at the disposal of District Collector, Ernakulam. 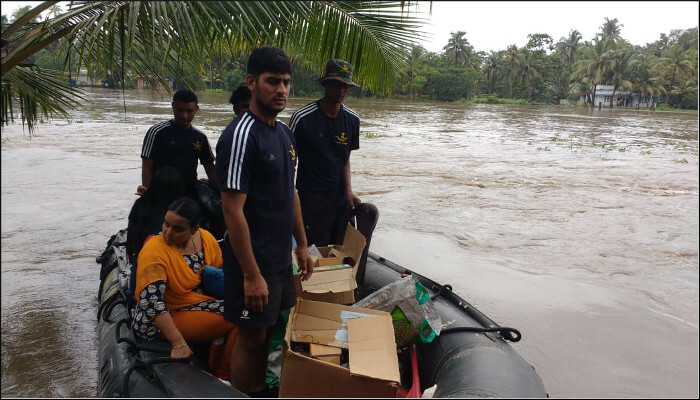 Of these, four teams are standby at Aluva and one is undertaking patrolling around Pizhala Island. 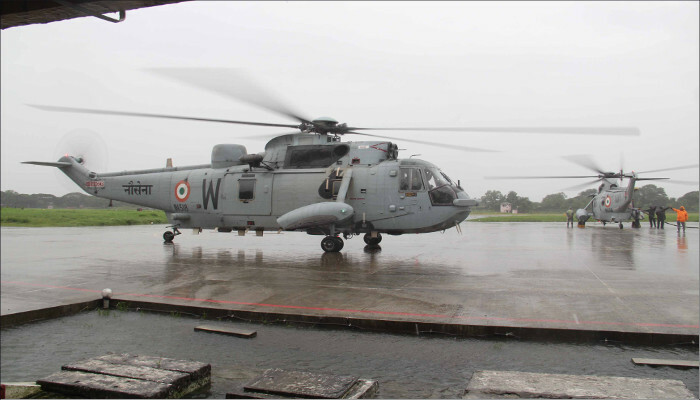 In addition, three fully kitted up rescue columns are kept standby at Naval Base. 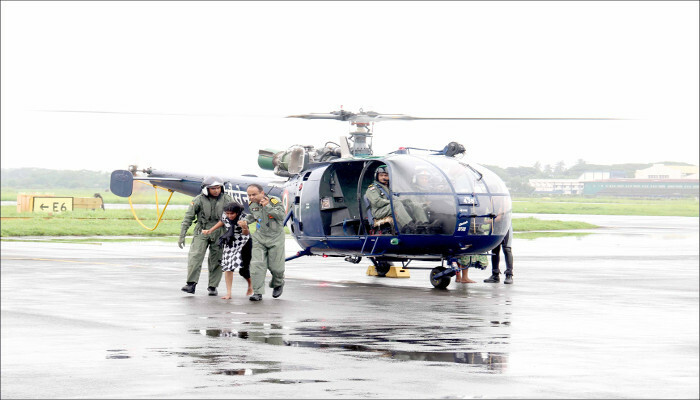 Southern Naval Command maintained all teams and assets deployed for Operation Madad on the fourth day - 12 August 2018. 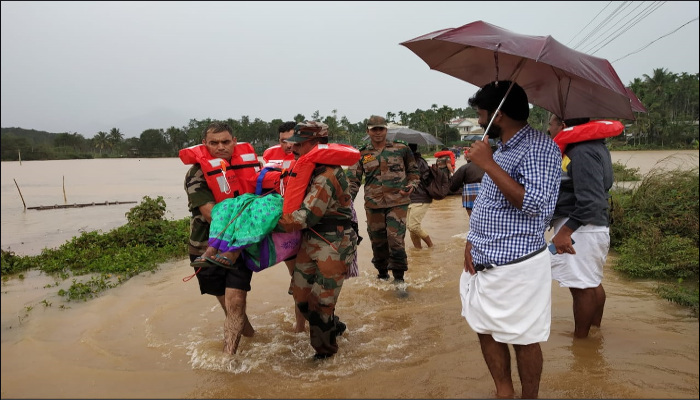 The teams deployed in different parts of Kerala have been holding firm and working round the clock to rescue stranded civilians, provide succour and medical treatment. 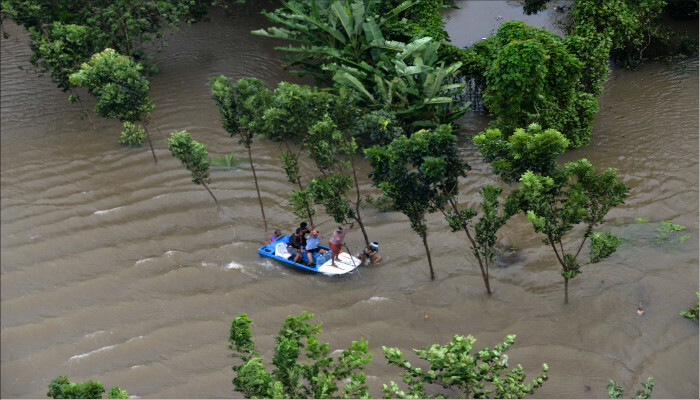 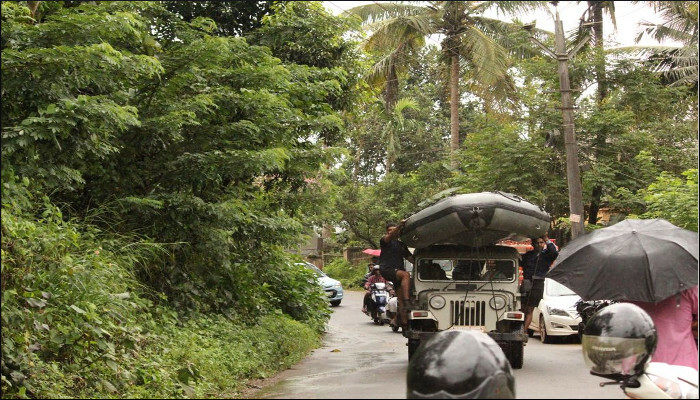 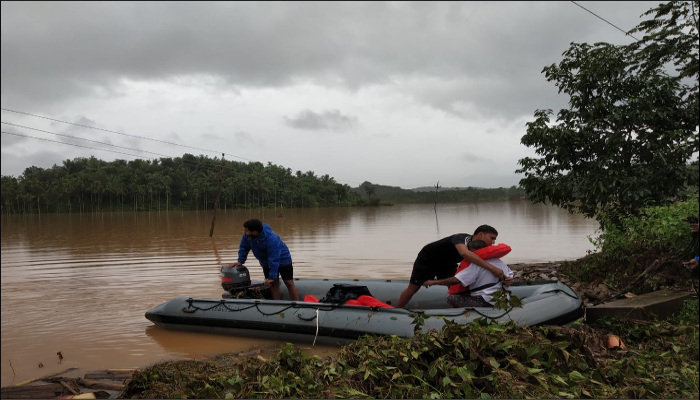 Four relief teams, with one Gemini inflatable boat each, are deployed at different locations in Wayanad district and carrying out relief operations in close coordination with Indian Army and National Disaster Response Force. 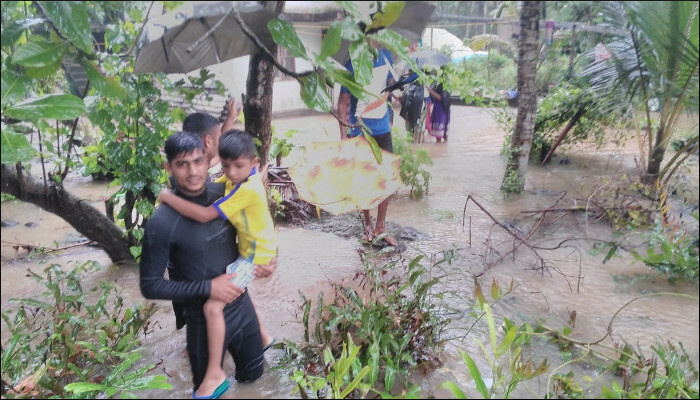 Five diving teams have been placed at the disposal of District Collector, Ernakulam with four teams at Aluva and one team undertaking relief work at Pizhala Island. 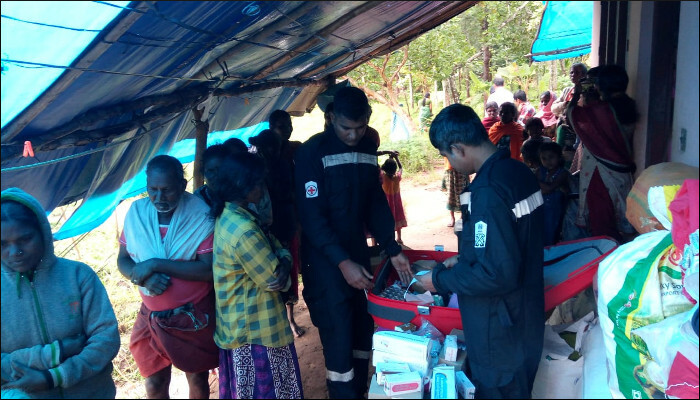 A medical camp at Thallaphuza (10 Kms Northwest of Mananthwady, Wayanad) was established on 12 August 2018 in coordination with civil medical team, which benefitted over 250 people. 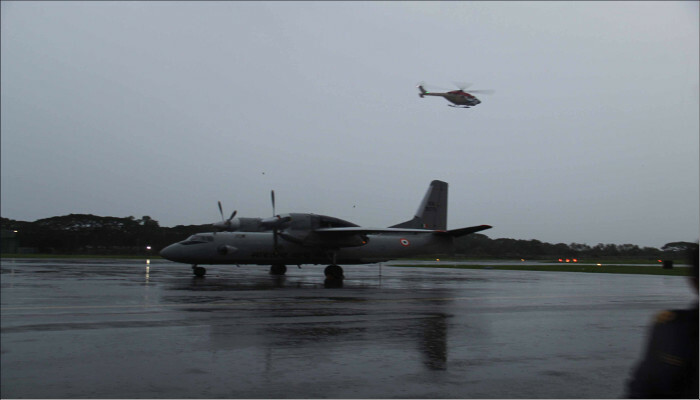 Naval aircraft are being continuously deployed from INS Garuda to carryout aerial survey and transport men and relief material. 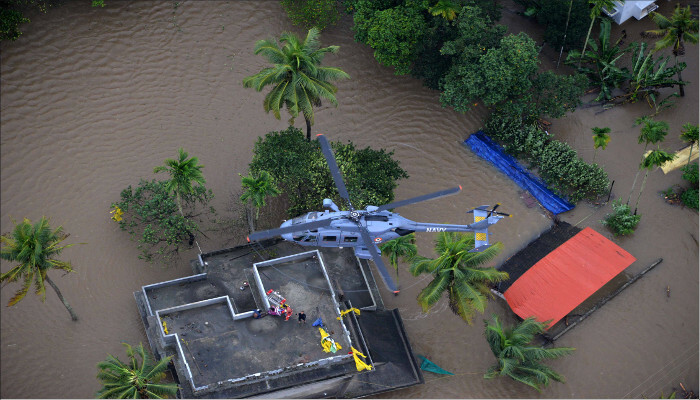 In addition, fully kitted up rescue columns are standby at Naval Armament Depot, Aluva and Naval Base, Kochi for any assistance sought by the civil authorities. 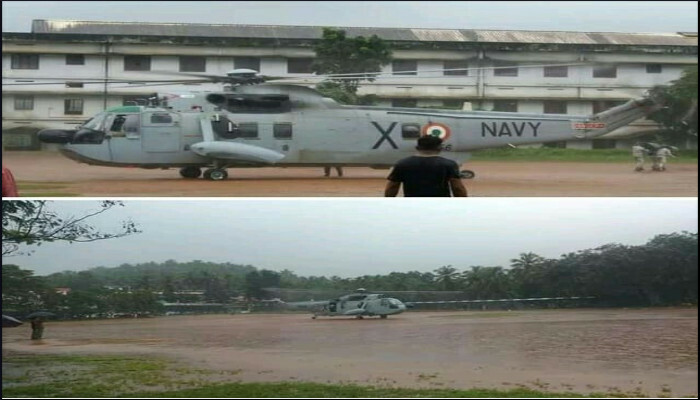 Naval teams deployed in different parts of Kerala by Southern Naval Command have been working continuously towards providing succour to the affected. 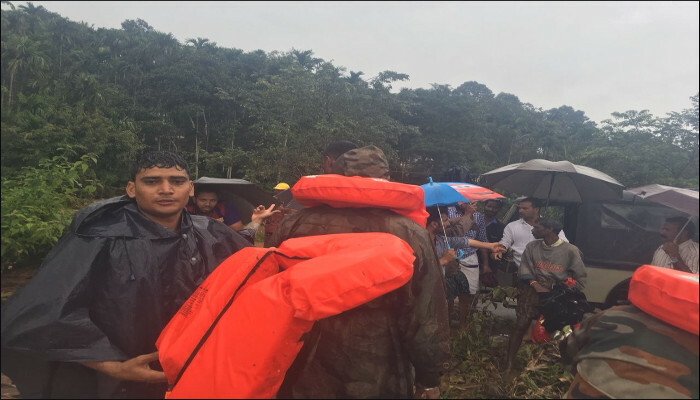 Three teams consisting of 20 personnel with Gemini inflatable boats are at Panamarum and have rescued more than 72 people till now. 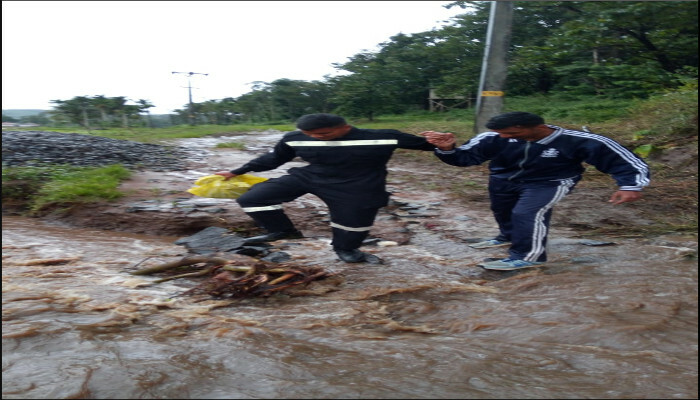 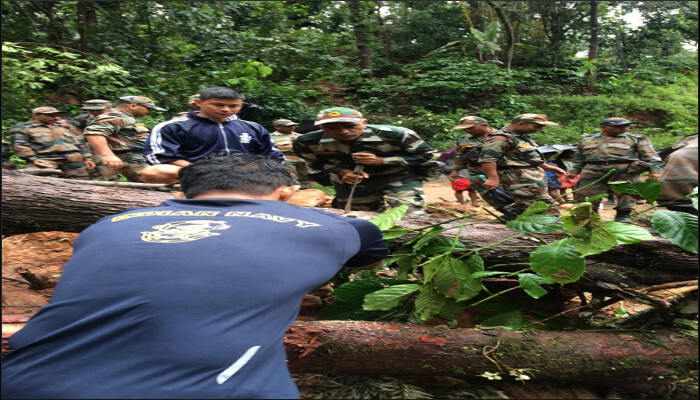 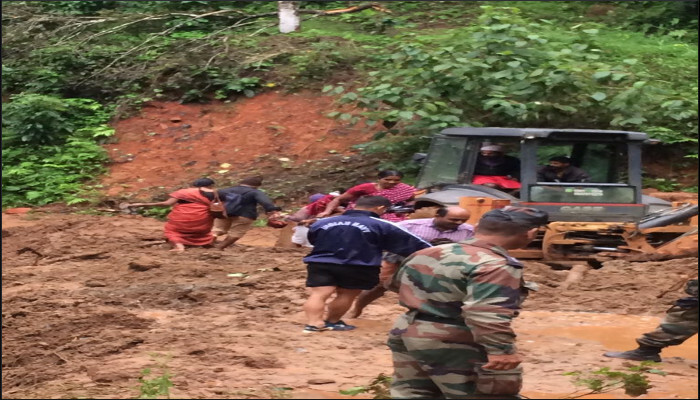 A team of 11 personnel is at Wayanad and is carrying out relief operations in close coordination with the Indian Army. 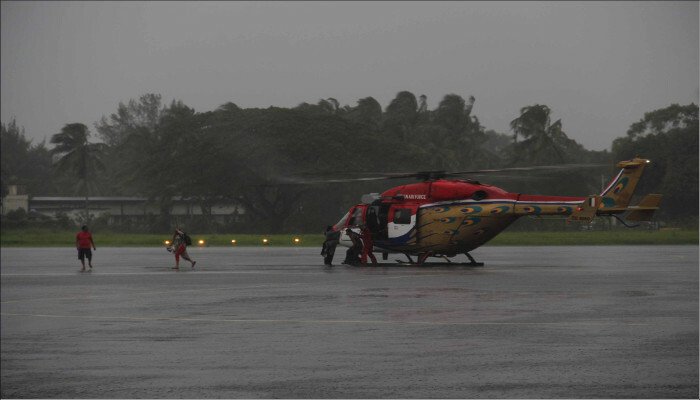 Sea King helicopter of the Navy has been extensively used to ferry diving teams, portable generators and other rescue equipment to Wayanad. 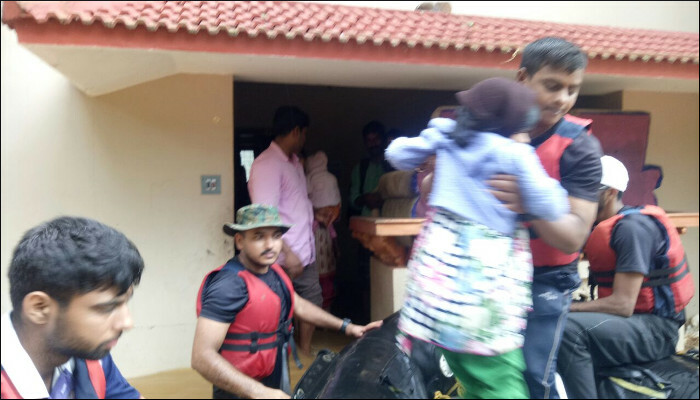 Another diving team with Gemini boat is stationed at Kodungalur, Trichur to carryout rescue operations in coordination with Civil Administration. 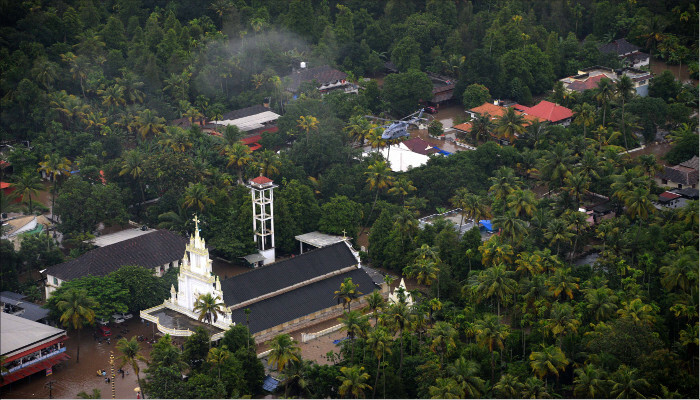 Three teams are at Puthenvelikara and one team is positioned at Pizhala island. 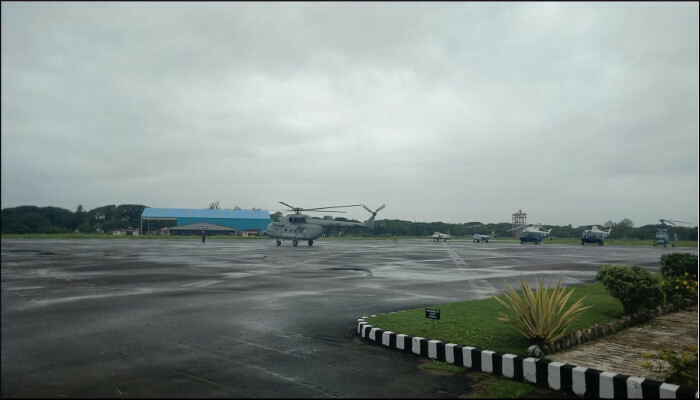 In addition, one rescue column of 31 personnel is positioned at Naval Armament Depot, Aluva to carry out disaster relief operations at short notice. 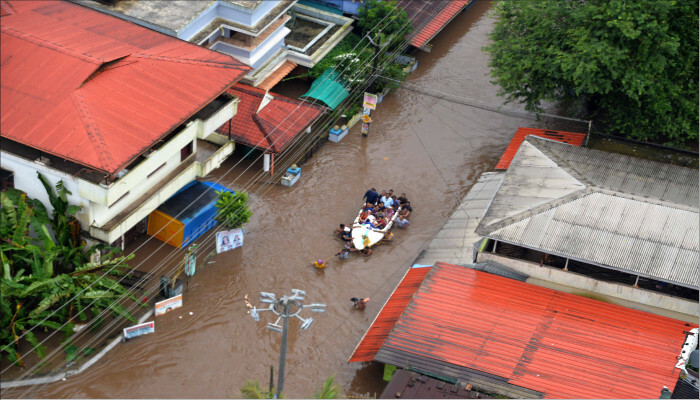 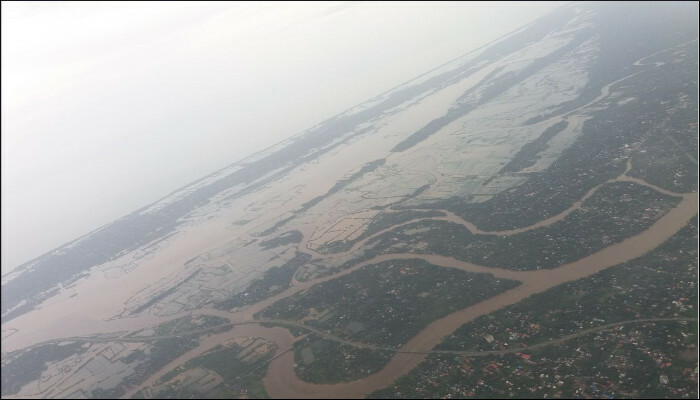 A naval Dornier aircraft was also deployed from Garuda to carryout aerial survey and report the extent of flooding to Civil Administration. 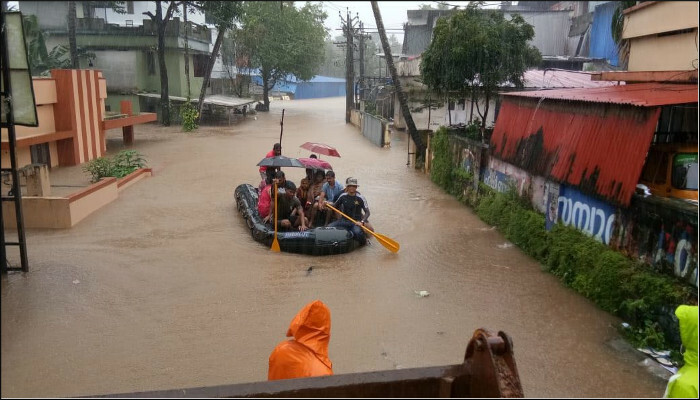 Five diving teams of 25 personnel, two columns of rescue teams of 60 personnel fully kitted up, medical and community kitchen bricks have been kept standby for any assistance sought by civil authorities. 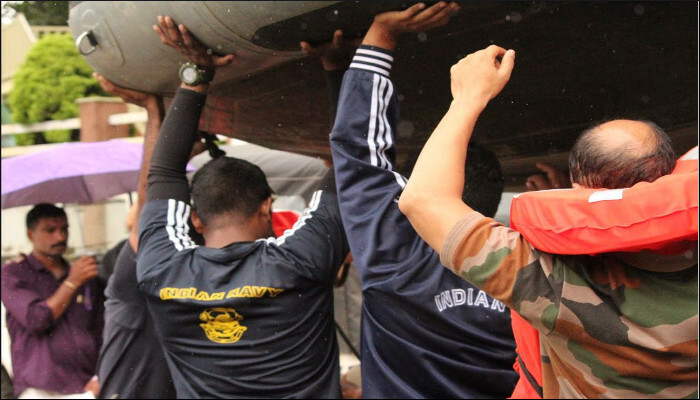 INS Garuda is manned round the clock and is being used extensively, not just by the Navy but also the National Disaster Response Force and Indian Air Force for moving rescue teams and supplies. 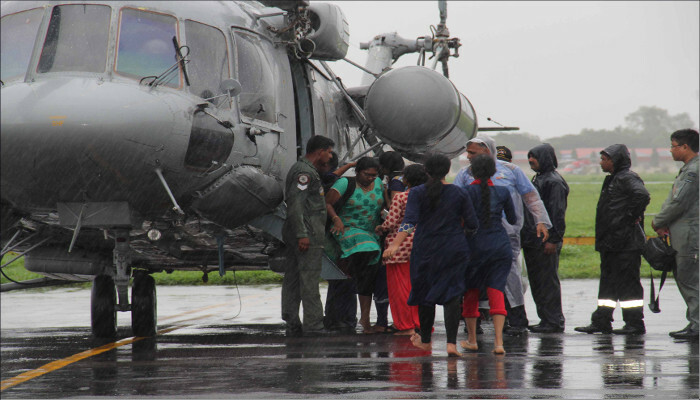 The Southern Naval Command continued rescue efforts in view of the unprecedented heavy rains experienced in many parts of Kerala. 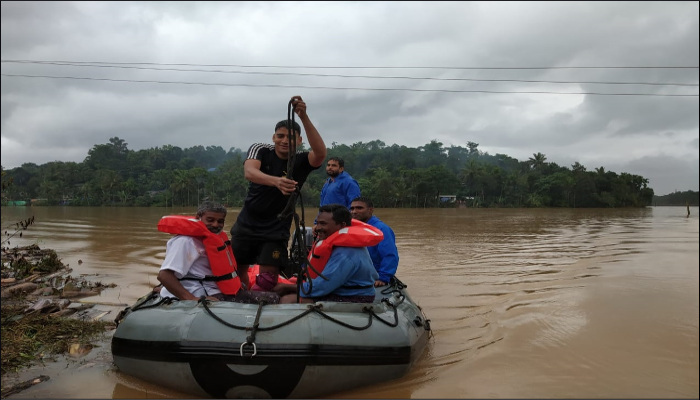 Based on a request received from Deputy Collector, Wayanad, one diving team with Gemini inflatable boat was airlifted and dispatched to Kalpetta at 2200 hours on 09 August 2018 to undertake rescue operations due to floods and landslides. 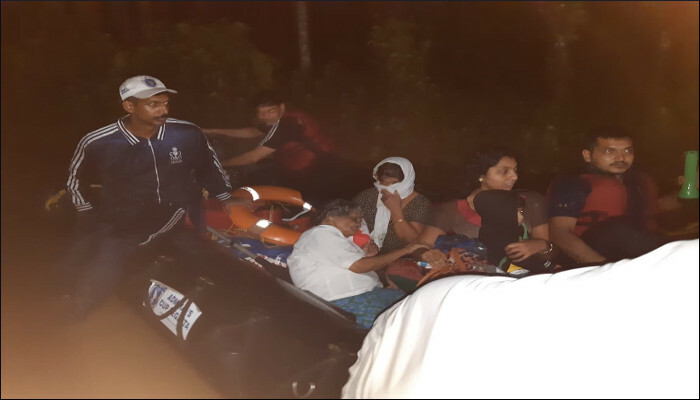 Three teams with Gemini boats commenced rescue operations at Panmarum (13 kms South of Mananthwady) and evacuated 55 stranded people on 10 August 2018. 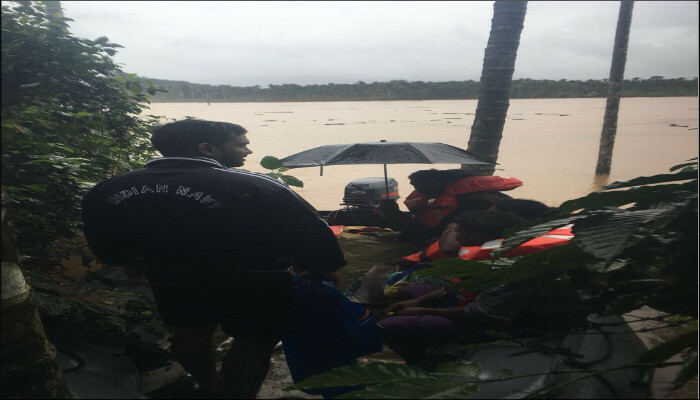 Three additional diving teams have proceeded to affected areas for augmenting rescue operations. 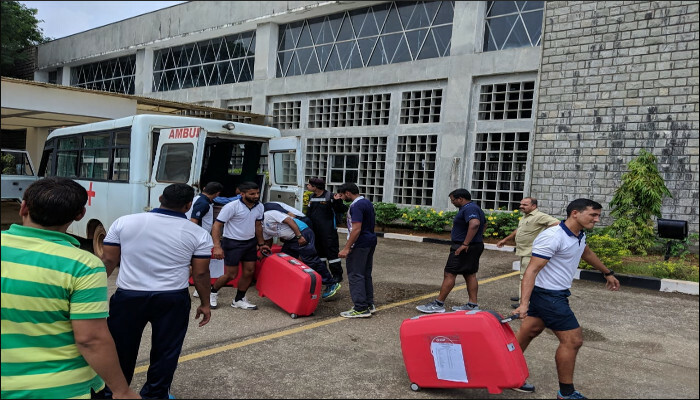 Two diving teams are standing-by at Aluva for relief operations in coordination with the Deputy Collector in anticipation of flooding expected in Ernakulam and Aluva due to opening of Idukki dam. 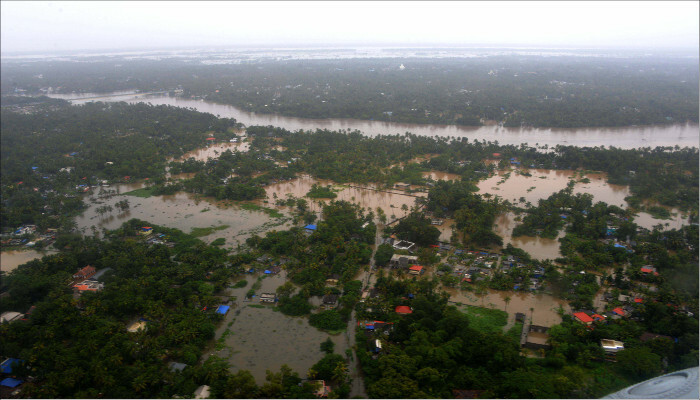 In addition, INHS Sanjivani and community kitchen of INS Venduruthy are standing-by for rendering any help needed. 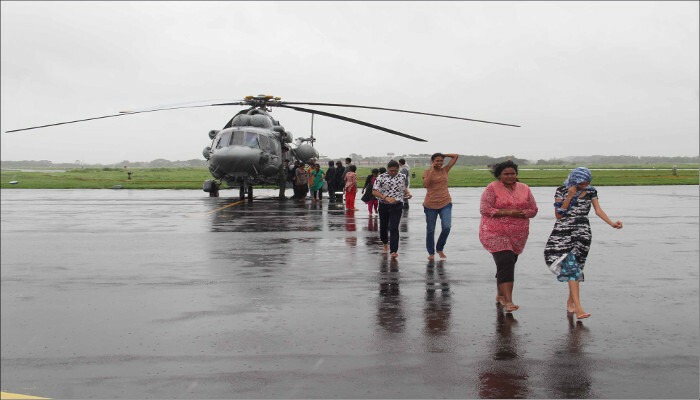 Naval helicopters are also being deployed for ferrying divers, power tools, axes and relief material to the flood affected areas to augment ongoing relief operations. 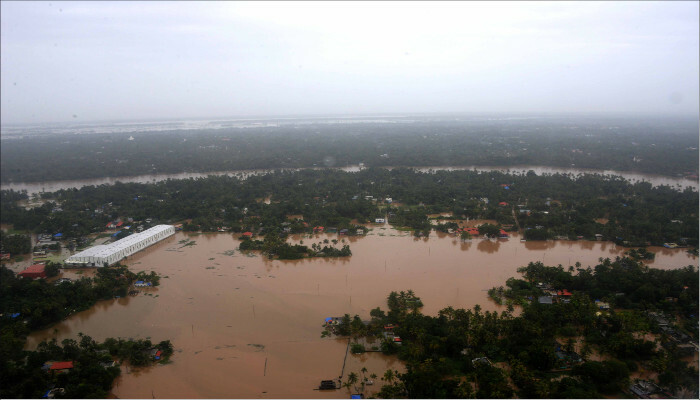 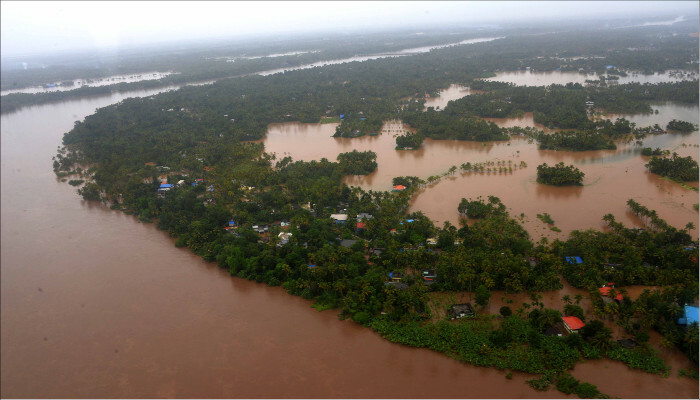 The Government of Kerala sought Indian Navy’s assistance for carrying out Search and Rescue operations in low lying flooded areas of Ernakulam and Idukki districts due to opening of Cheruthoni dam shutters and Wayanad district following heavy rains. 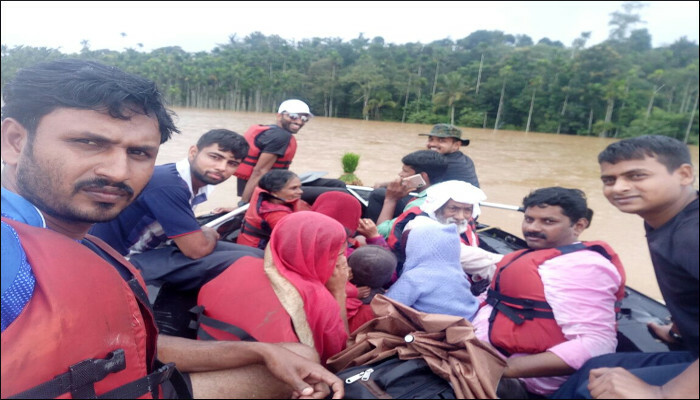 The Southern Naval Command dispatched four diving teams with dinghies to Mananthavady and Kalpatta in Wayanad District on 09 August 2018 to render assistance to the local populace. 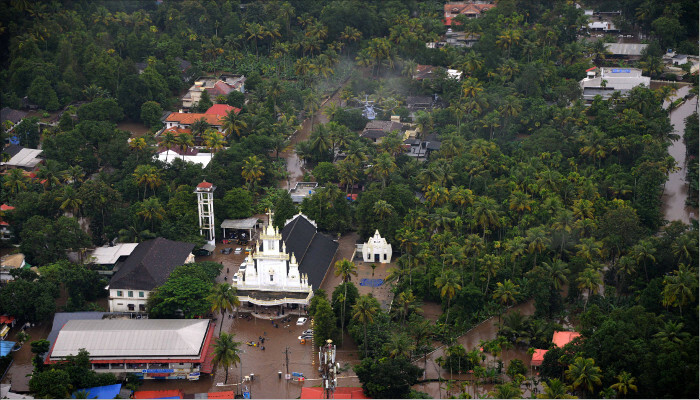 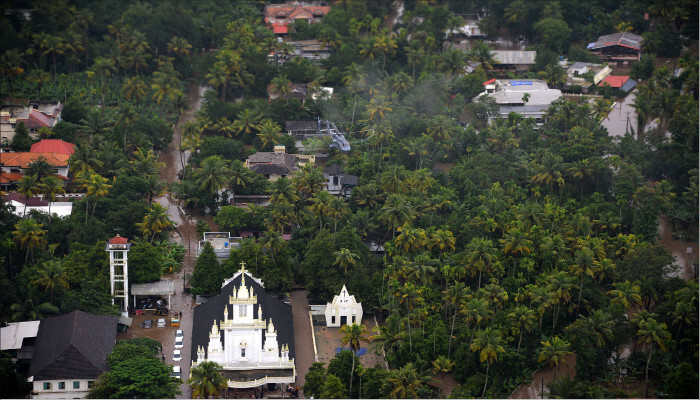 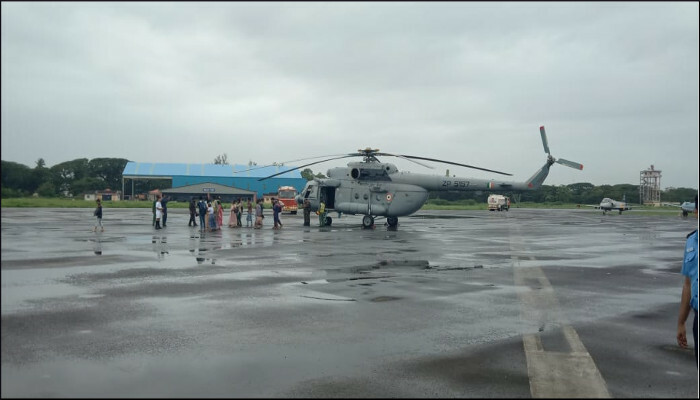 In addition, one Sea King helicopter was also dispatched to Wayanad for evacuating any stranded people. 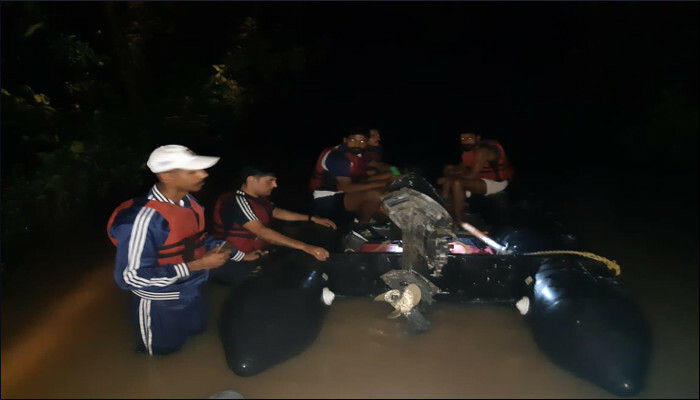 The team is carrying three inflatable boats, rescue equipment and medical supply to provide first aid and is in constant touch with the District Collector.